Looking for a way to really impress your guests? That extra special something that will make a summer night BBQ a night to remember? 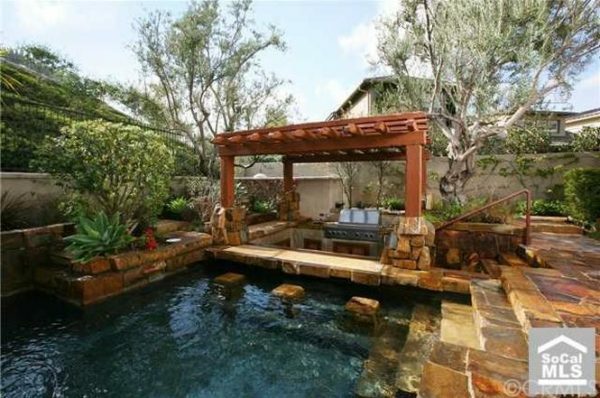 Need that little backyard paradise where you can escape and forget your worries? 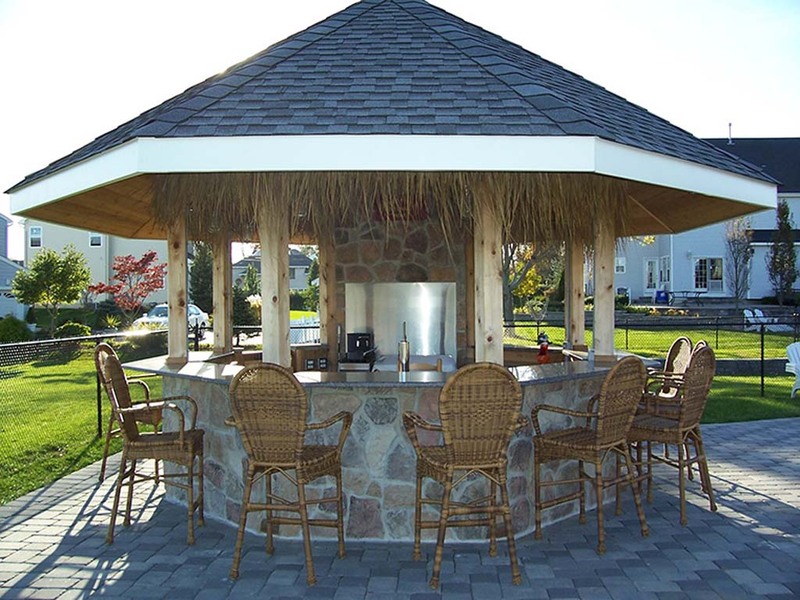 Well, maybe it's time to join the latest trend… outdoor bars! Who says you have to leave the comfort of your home to have a drink with friends or to enjoy a fresh beer while watching the football game? Not us! We believe you don't even have to change out of your pajamas if you don't want to. Bring the pub to your house and build it right in your backyard. 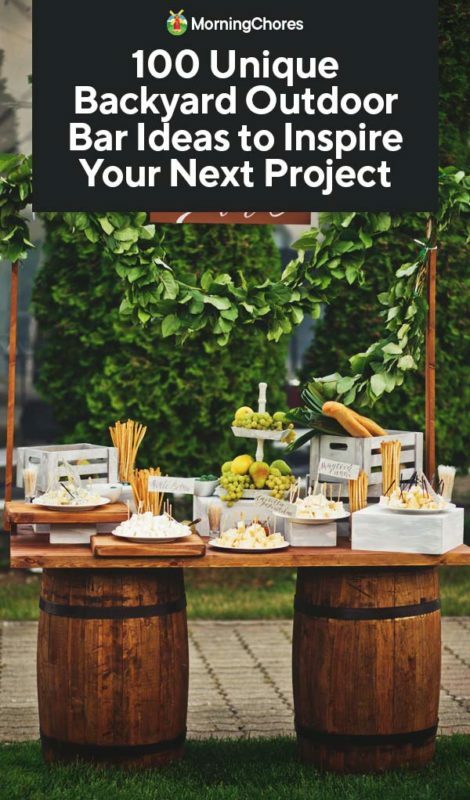 To get you inspired we've come up with a list of 100 unique outdoor backyard bar ideas that you're going to love. 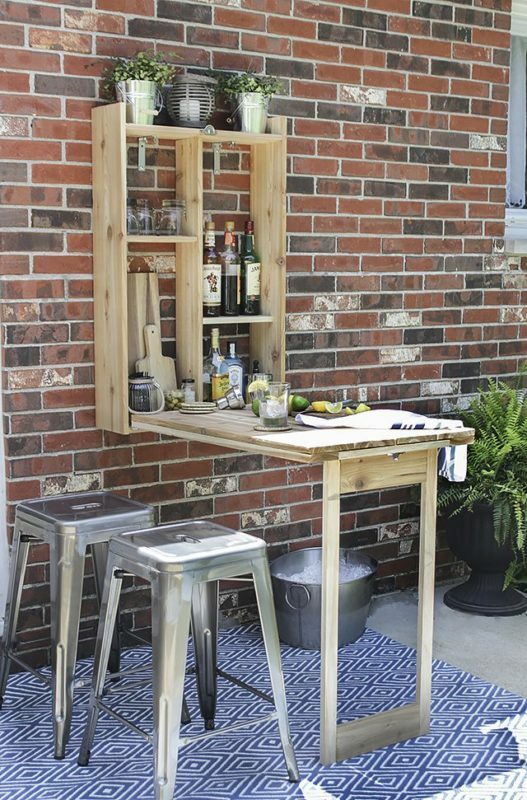 An inexpensive idea on how you can turn something as simple as a potting bench into a functional outdoor bar. Fold your bar away when you're done serving up cocktails with this clever Murphy bar design. 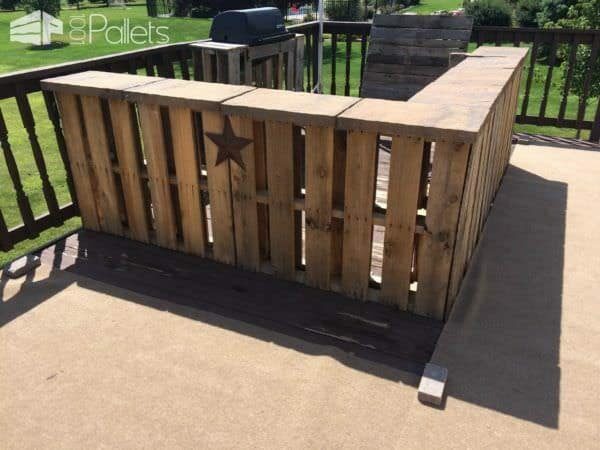 More of a traditional-looking bar in an L-shape but made out of recycled pallets! Fabulous! 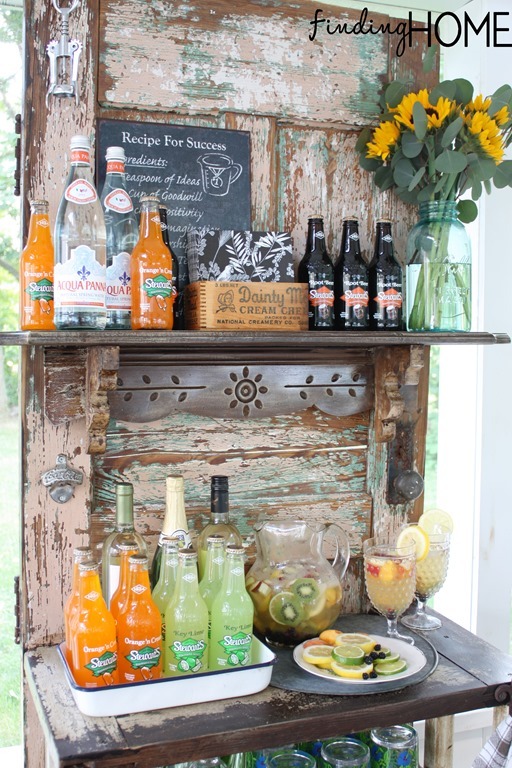 This outdoor bar has been made using an old vintage door with some added shelves and chalkboard. Really digging this design with windows that open up so it's functional when there's rain or shine! 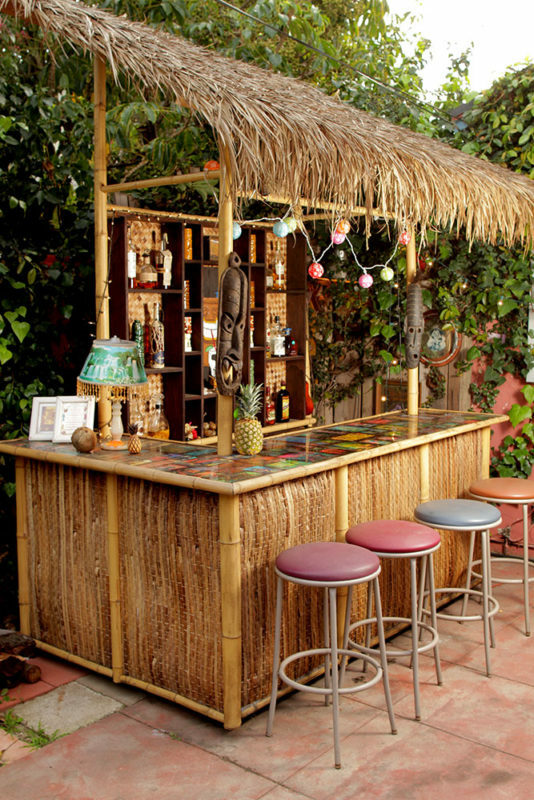 A fun tiki bar design to fulfill your vacation fantasies in your very own backyard! 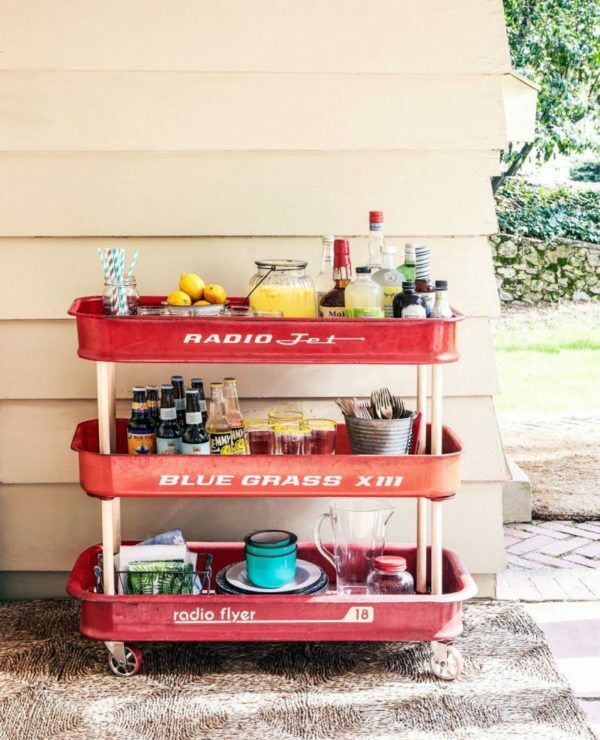 This bar cart really hits the nostalgia button! First a toy for kids and then a toy for adults! 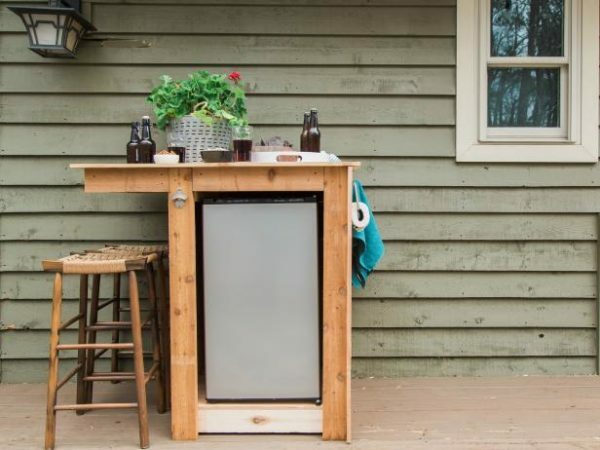 An outside bar complete with its own mini-fridge? Talk about awesome! A circular gazebo bar is a perfect addition to hosting memorable outdoor parties. No need to even leave the bar with this cool design! 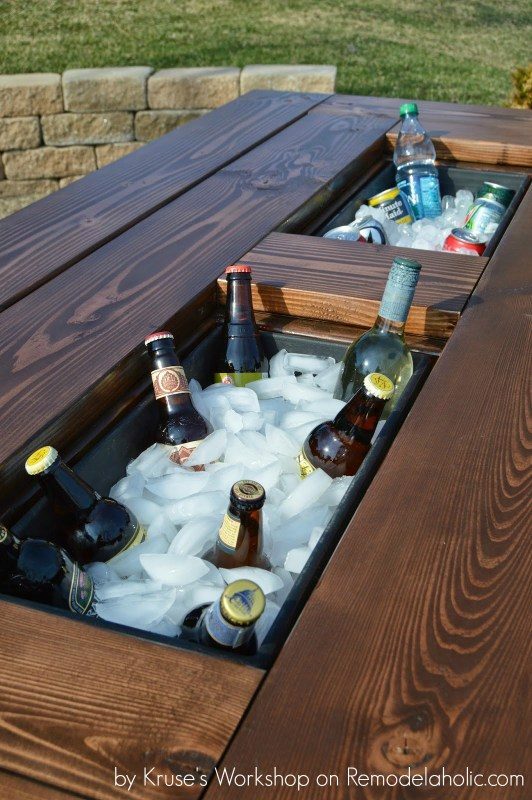 The ice-boxes are built right into the patio table! Do you have a pool? Put your bar right on the edge so you never have to leave! 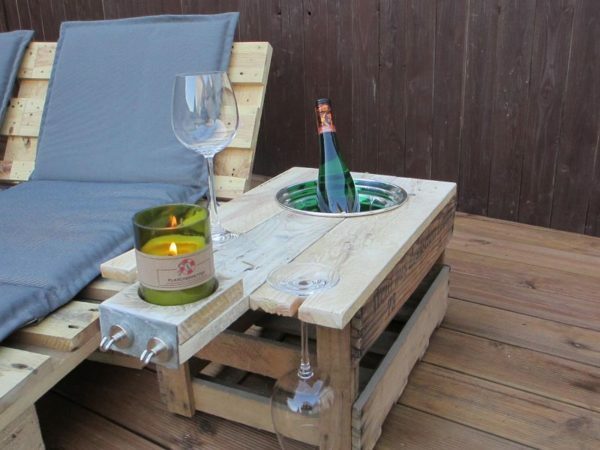 A bar built right into your side table, complete with wine bucket and wine glass holders. 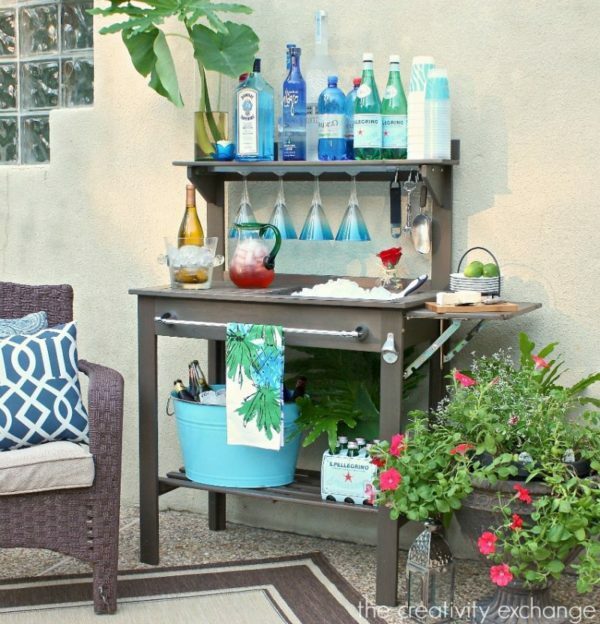 Maybe all you need for your outdoor bar is a wine rack! That's great too! 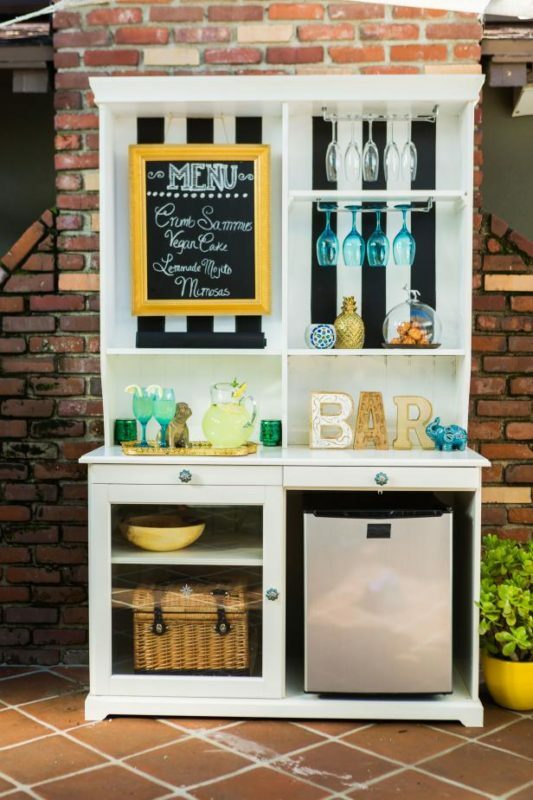 Upcycle an old hutch into a totally stylish and very functional outdoor bar with mini-fridge and bar menu! 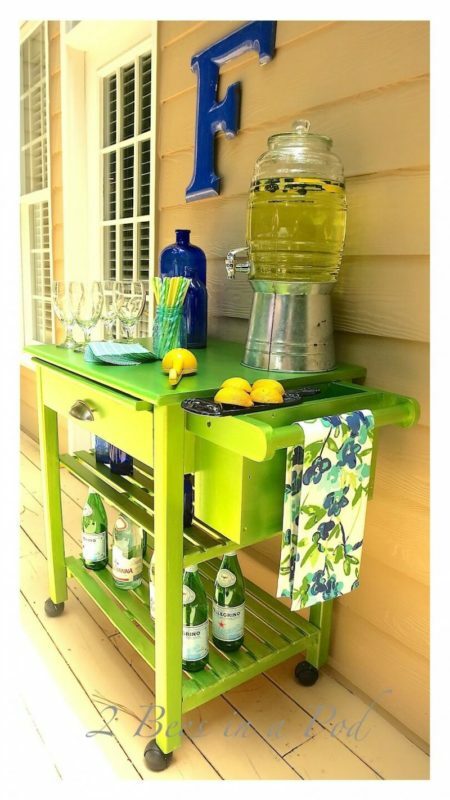 Upcycle an old microwave cart into a fun and vibrant outdoor bar with a fresh coat of paint. 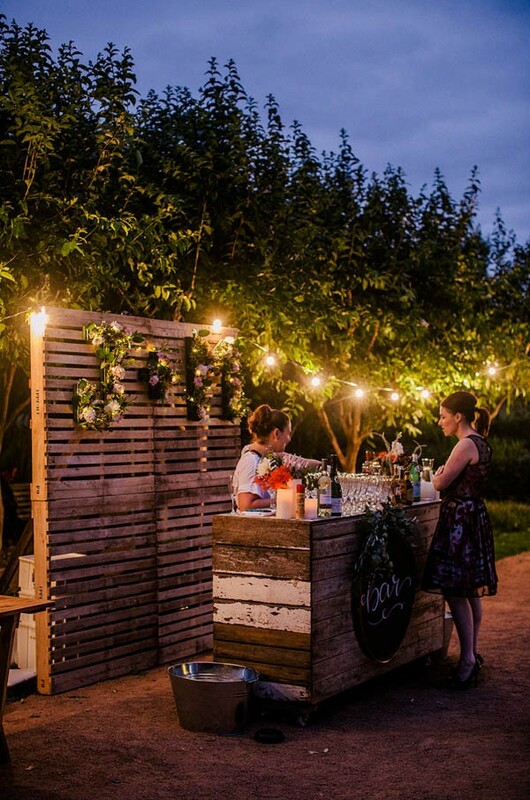 A rustic bar you can put together for hosting events in your backyard that will definitely be remembered. 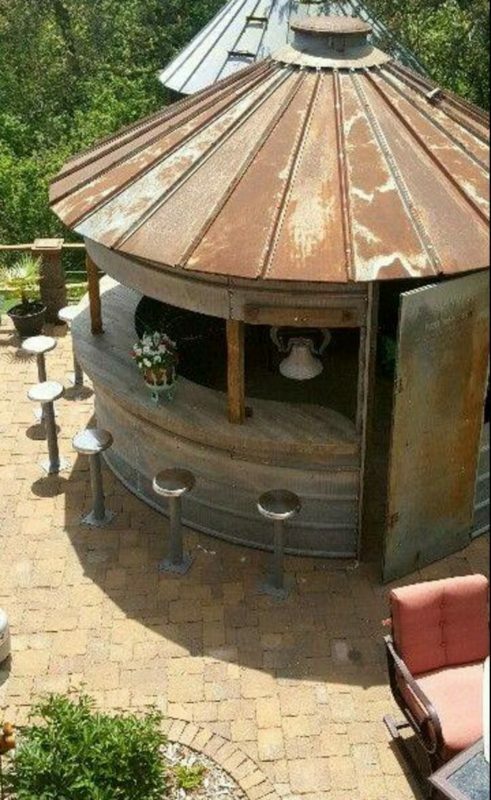 A refurbished grain bin becomes a bar! 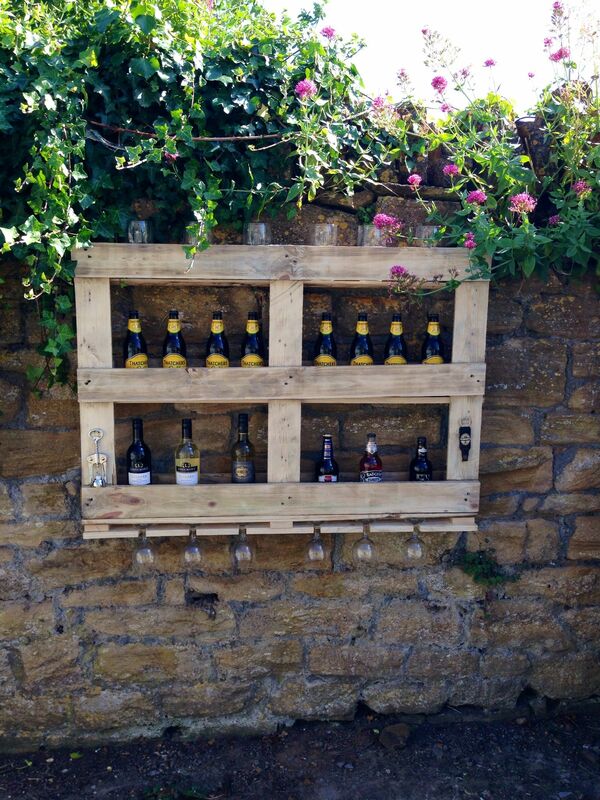 A great addition to your farmhouse patio. 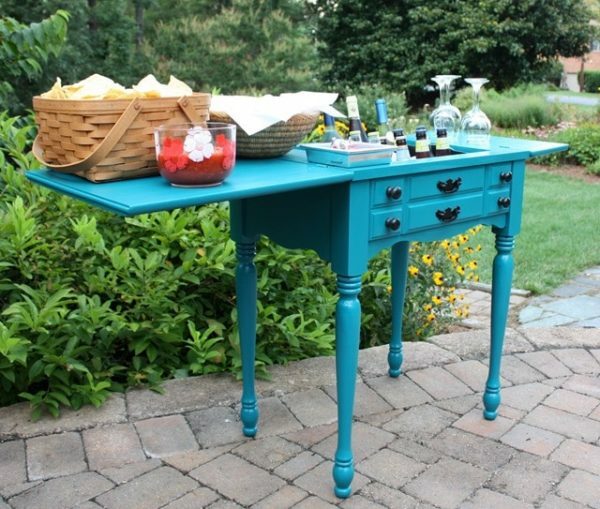 Another way you can take an old piece of furniture and turn it into a serving station is with a sewing cabinet! Materials that you have laying around the property can be used to make a wonderful bar area. 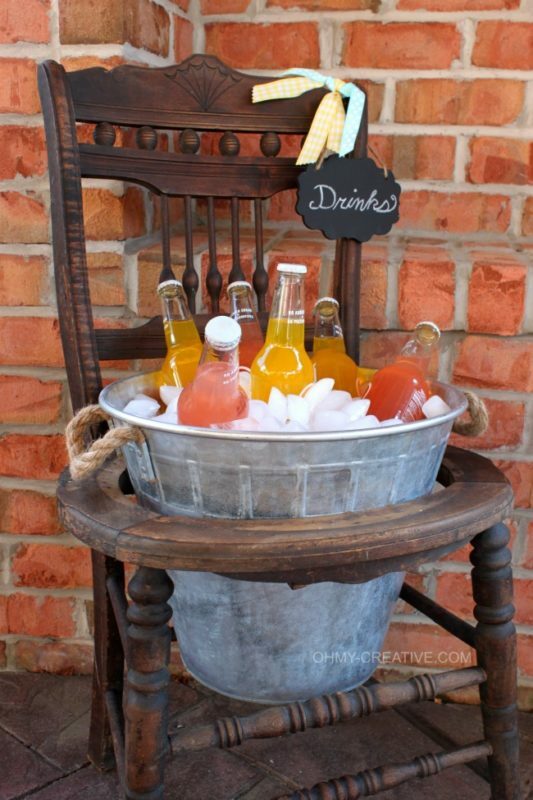 Turn an old vintage chair into a functional and unique ice bucket stand so your drinks always stay cold! Go big or go home! Or I guess in this example… go big AT home! 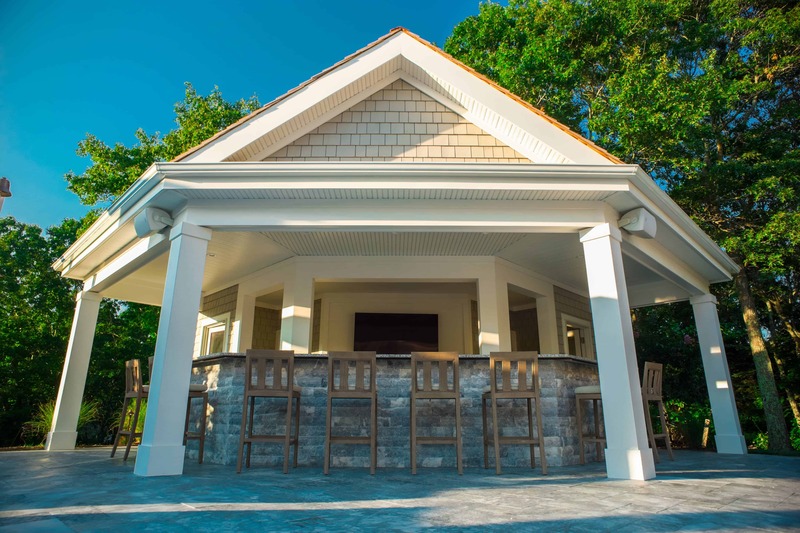 This outdoor bar is absolutely luxurious. 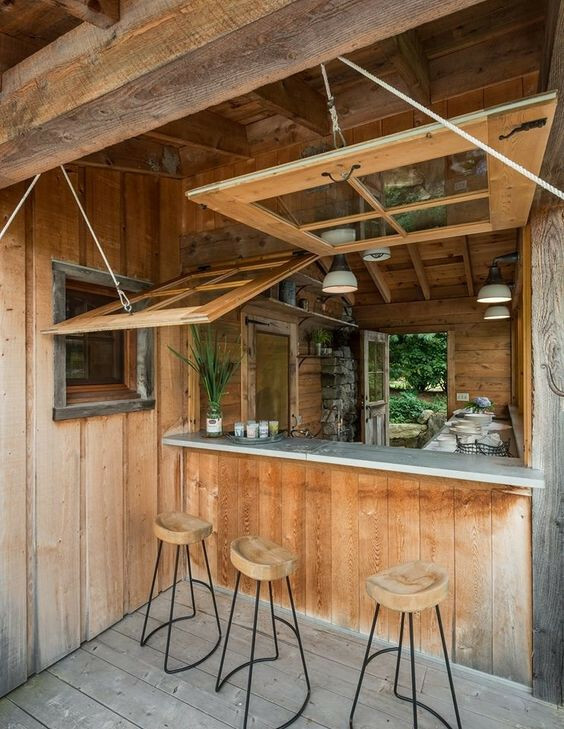 Make use of your garden shed again by transforming it into a functional bar equipped with TV and everything! 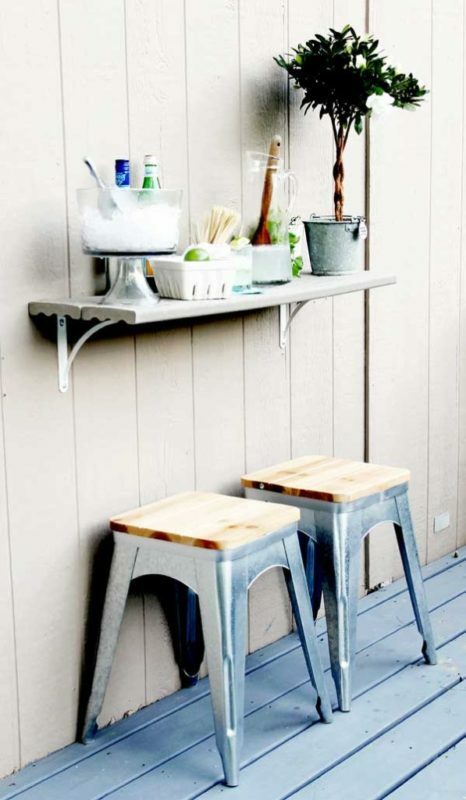 All you really need for an outdoor bar is a place to mix the cocktails and a couple of bar stools. 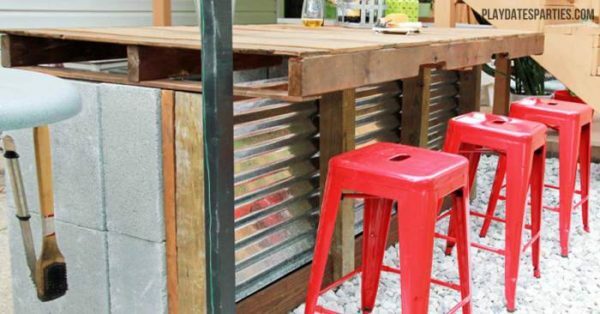 Made from scrap pallet wood and sheet metal as the sides this DIY bar is stylish and supportive! 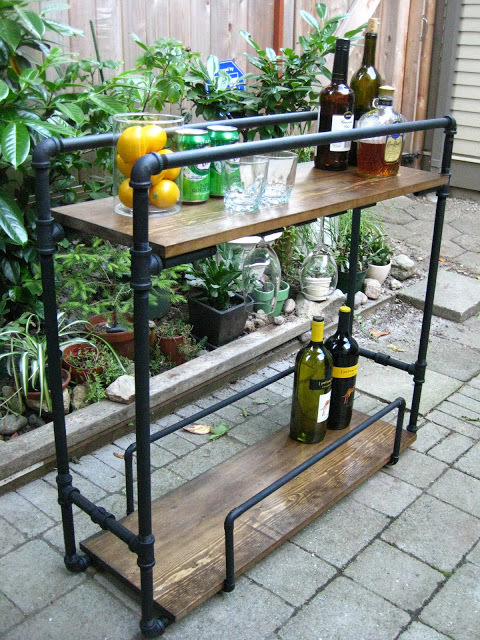 This outdoor bar has an industrial feel to it from using dark metal pipes and beautiful stained wood. 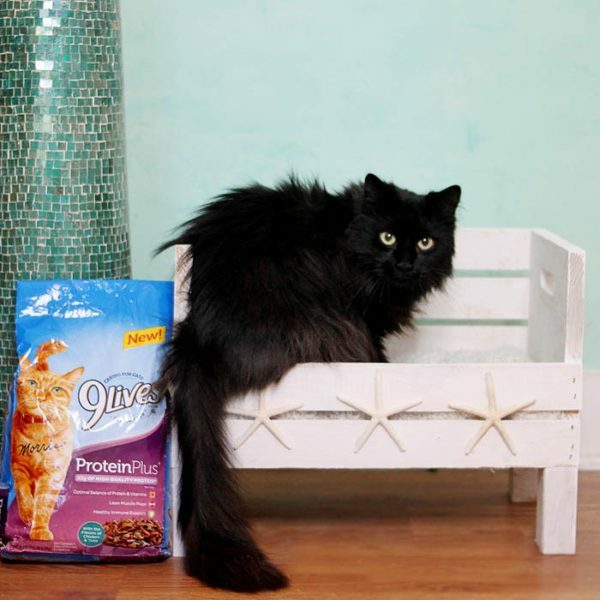 Does your furry friend need a new place to rest his/her tired paws? A soft place to curl up and sleep the day away? 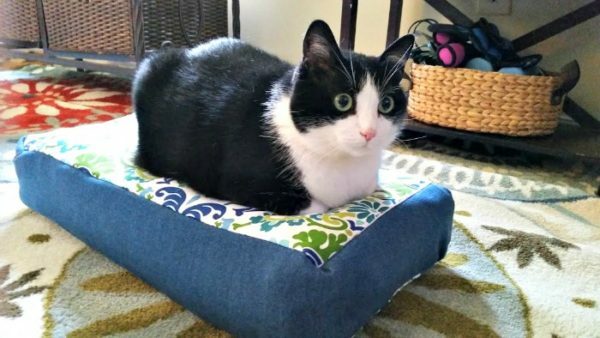 Well, don't just go out and buy your kitty a bed, show how much you love them by making it yourself! There are lots of ways to design and create a cute and comfy place for your cat. There are stylish and chic beds, funky and fluffy ones, or secret hammocks when they want to really relax. 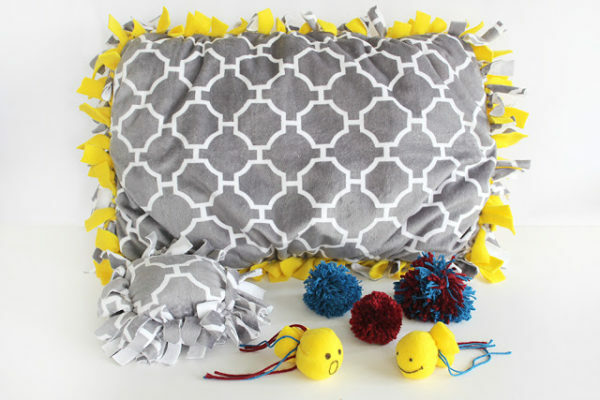 Have fun making a new bed for your cat by personalizing it with your favorite colors and patterns. 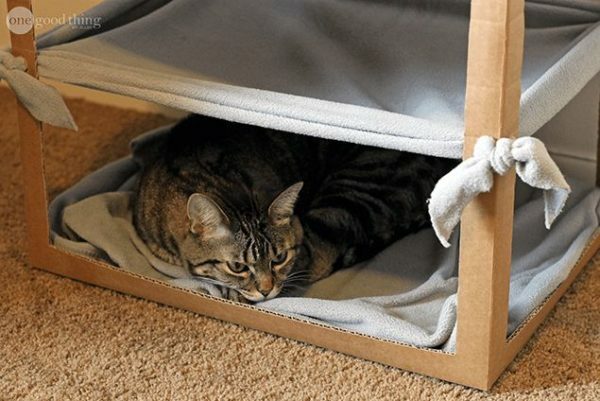 But, to get you started, here we have 30 cat bed tutorials for creating your cat a cozy place to rest. Do you have a special relationship with your furry friend? Then show them they are special with a personalized bed! Does your cat always curl up next to you as you watch Stargate? He might be a fan! 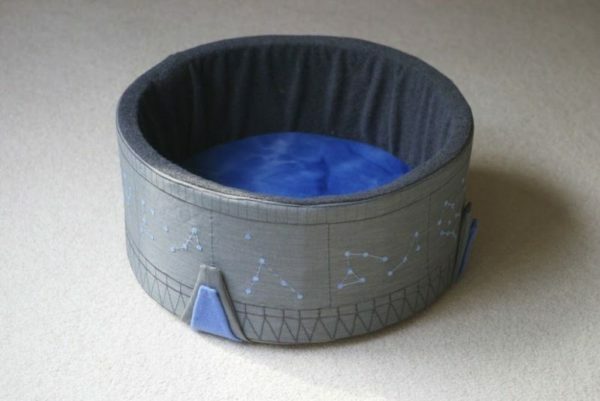 A super charming and super cute kitty bed for your kitty friend! 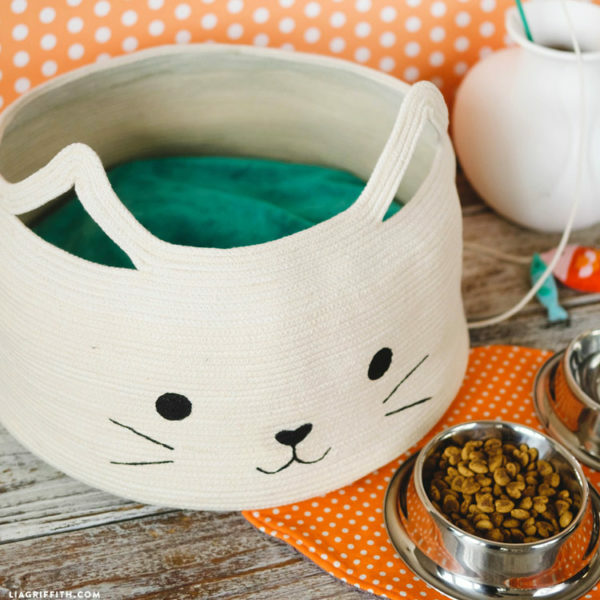 Here's a beginner sewing project that both you and your cat will benefit from! 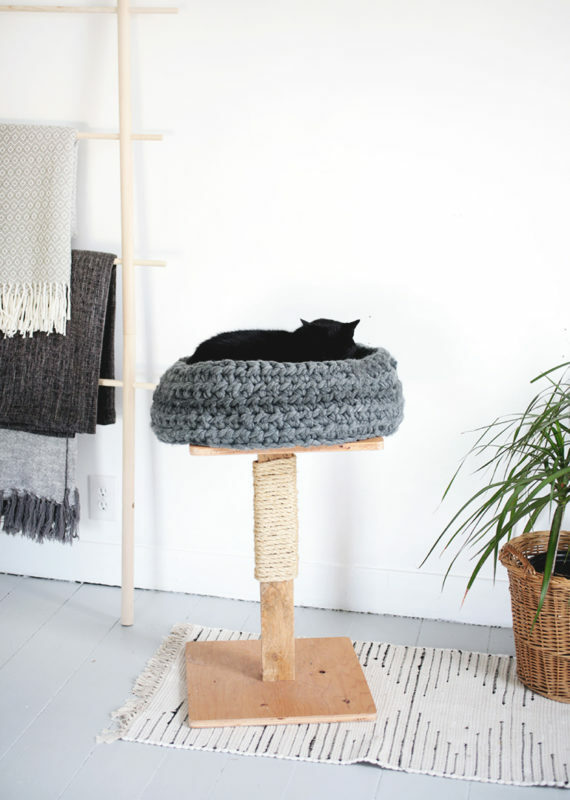 This cat bed is both comfortable and chic so you and your cat will equally love it. 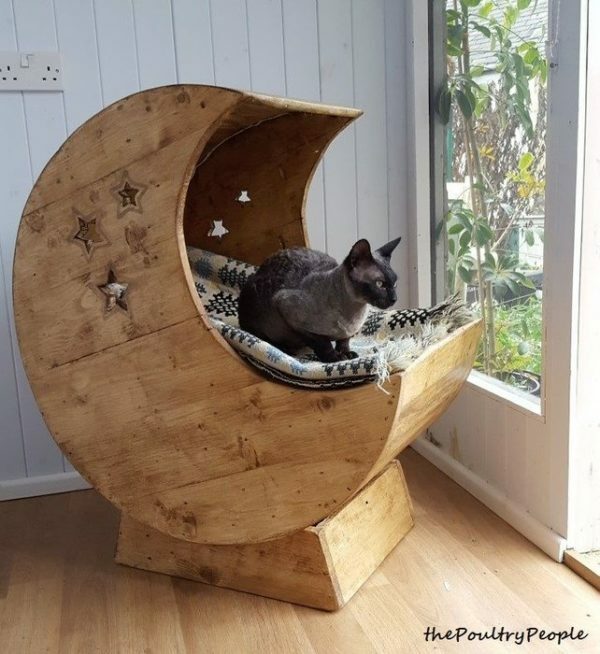 I am totally in love with this boho-chic cat bed which just so happens to be made from pallet wood! 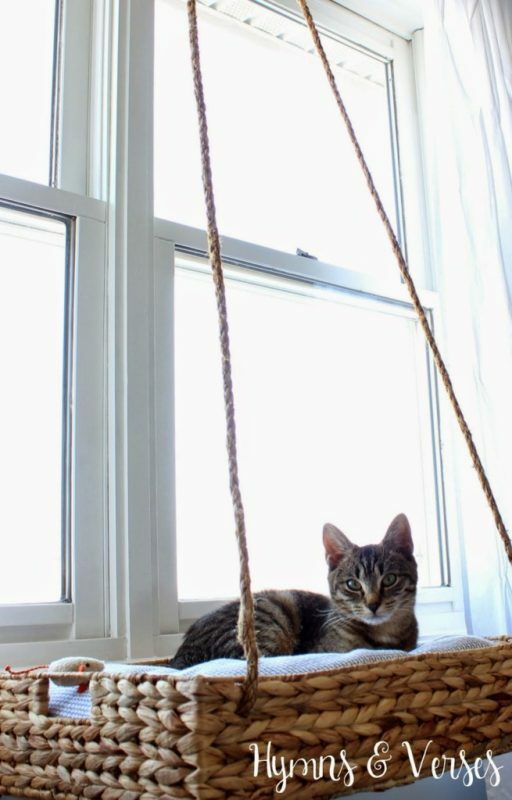 Give your cat a window seat to watch the birds fly by and dream of mice. 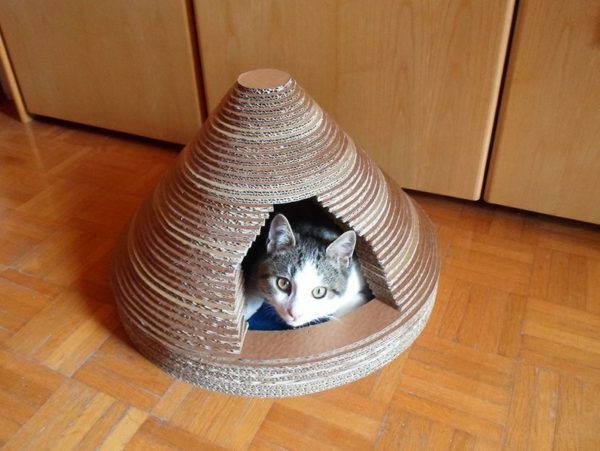 Your cat will love its new personal private space where he can get away from all the pesky humans. A place to just chill out and relax. This hammock would also be great hanging between your chair legs. A fluffy place to relax suspended from the roof to get away from all the people! 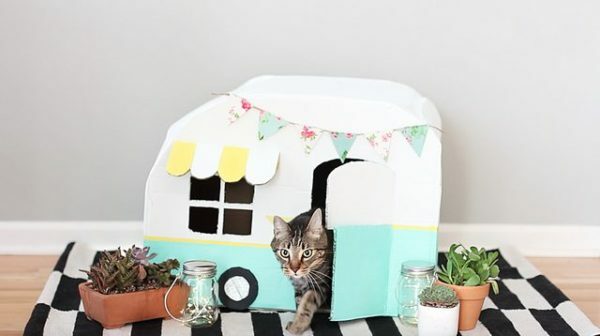 You just might be jealous enough of your cat's tiny camper that you get one yourself! 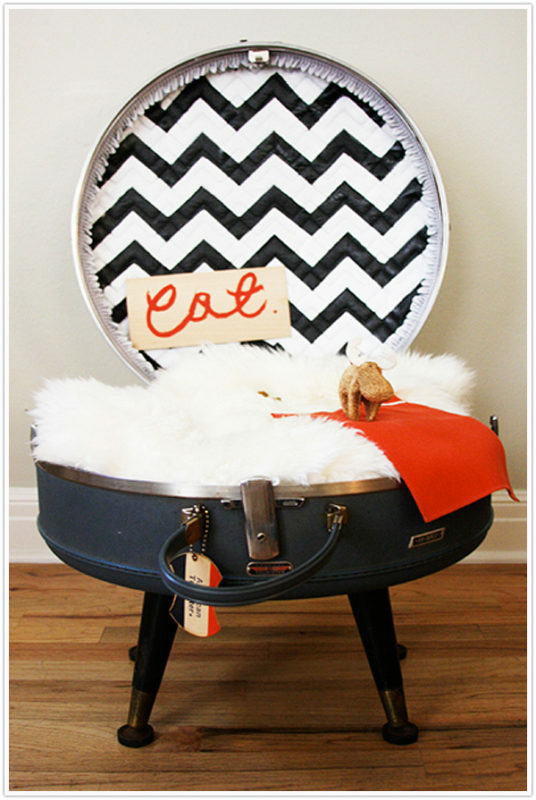 How charming is this vintage circular suitcase upcycled into a cozy bed for your little kitty!? Get your crochet hook out and pick out your cats favorite color yarn to make it a new place to hide. 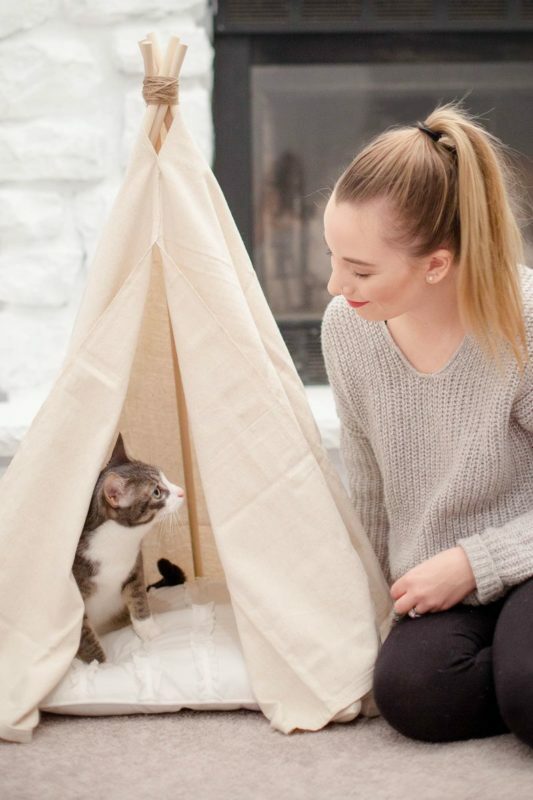 A soft and cozy DIY cat bed that has a boho vibe with a minimalist look. Is your cat just as nerdy as you are? Then they will definitely love this Super Mario bed! 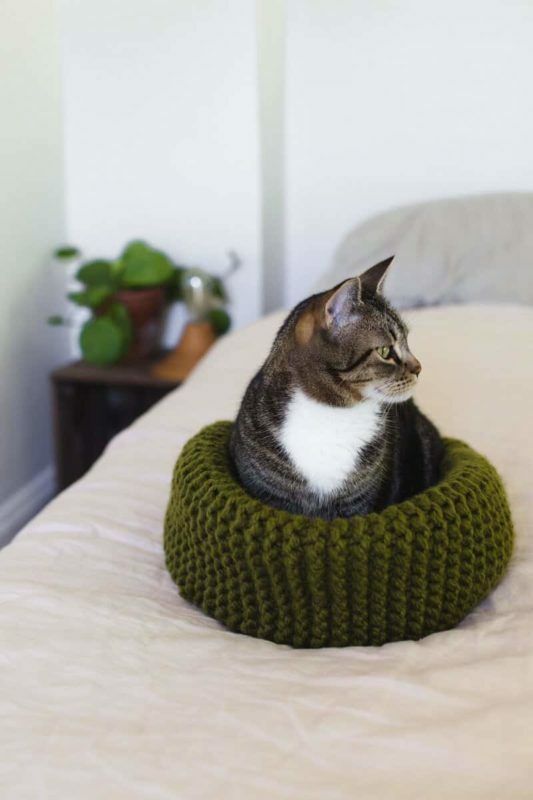 If you prefer knitting more than crocheting than don't worry, there's a cat bed pattern for that too! Your beach vacation cabin needs a cat bed too! 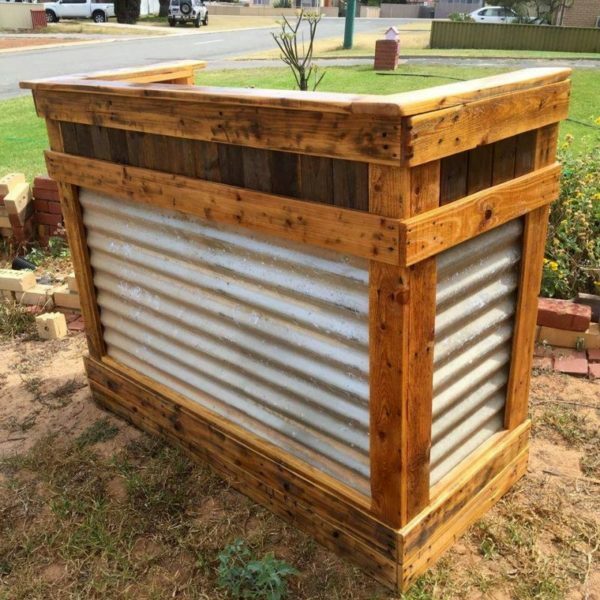 So go for a coastal look that is made from an old crate. 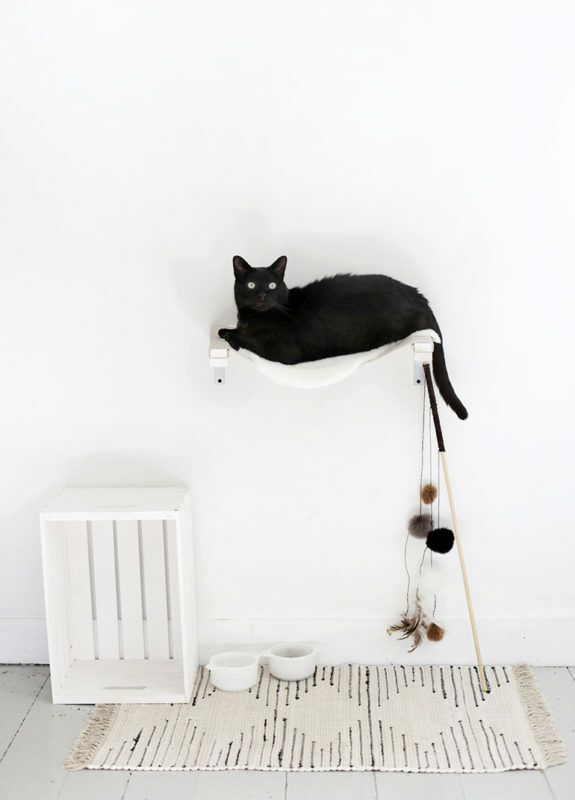 Here's a fun cat hammock that just sort of blends into the wall but not enough that your smart kitty won't find it! 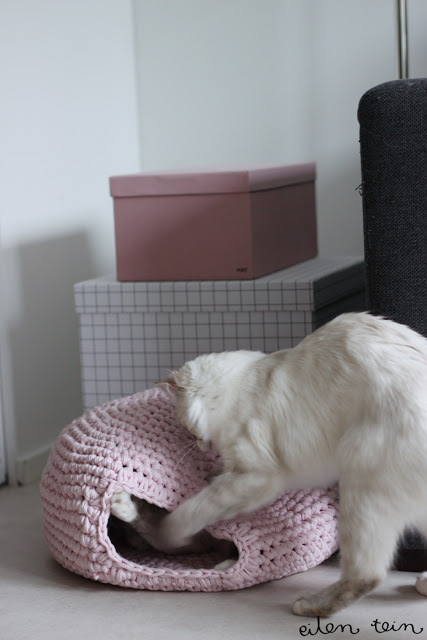 Another beautiful crochet cat bed that not only looks great but feels great for kitty! 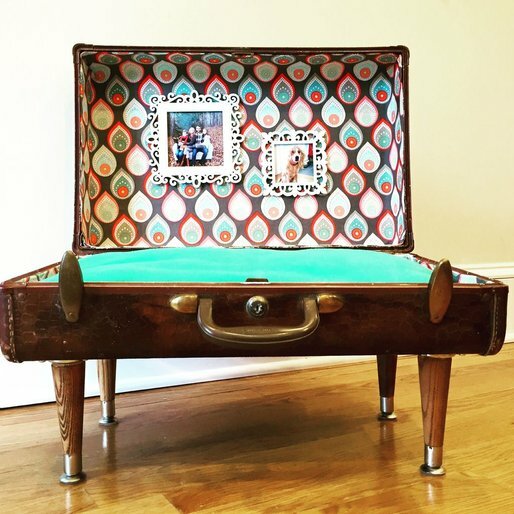 Turn an old vintage suitcase into a shabby chic furniture piece that your cat will love! 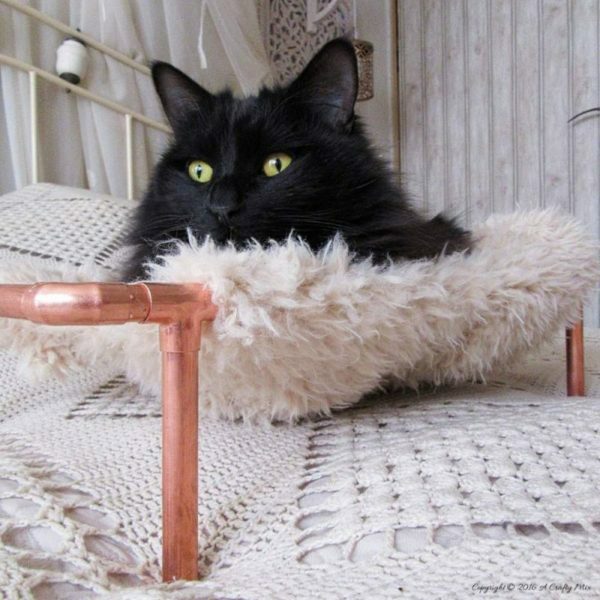 Using beautiful copper pipe and an old fluffy sweater, you can make this unique cat bed. 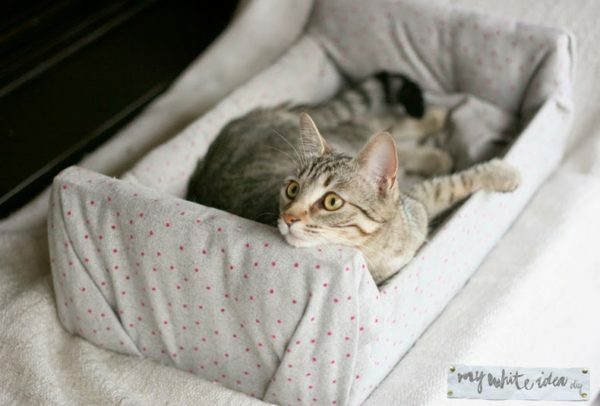 A simple and easy-to-make cat bed that requires no glue and no sewing. 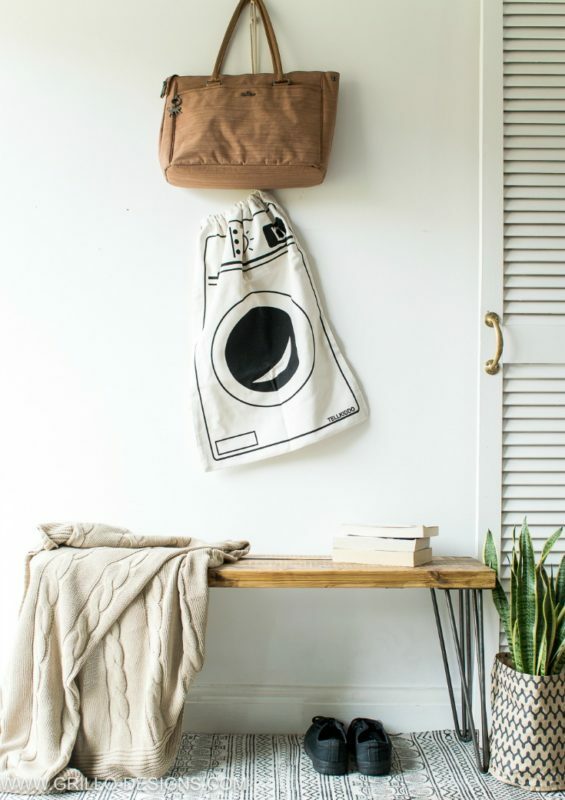 This project takes only moments to make and uses items that you most likely already have at home! Start with a simple recycled fruit box, throw in just a few more materials, add your creativity and voila! 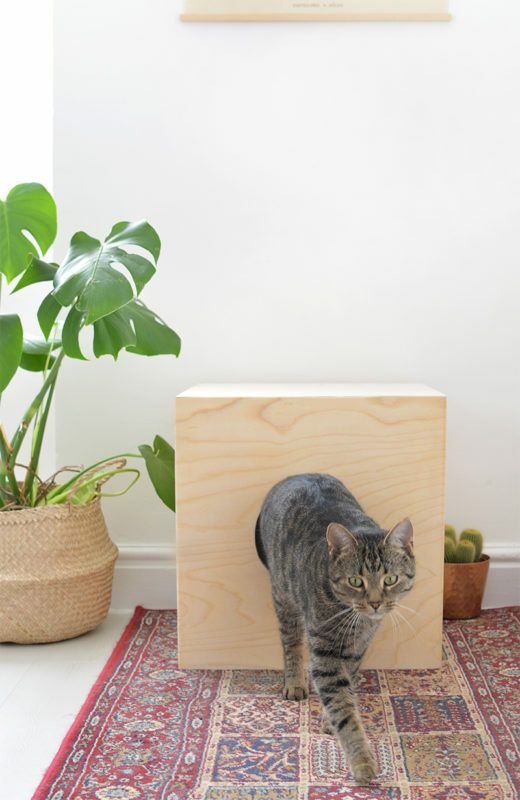 This cat box will look great with almost any interior design and has a cozy bed hidden inside. Do you have a lot of cardboard at home that you just can't seem to get rid of? This is one way to use it! 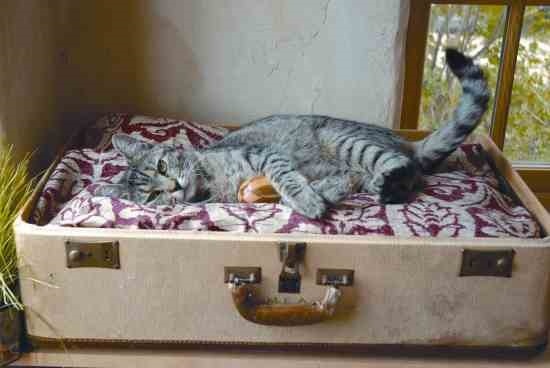 Just look how comfy that cute little kitty looks in her upcycled bed! 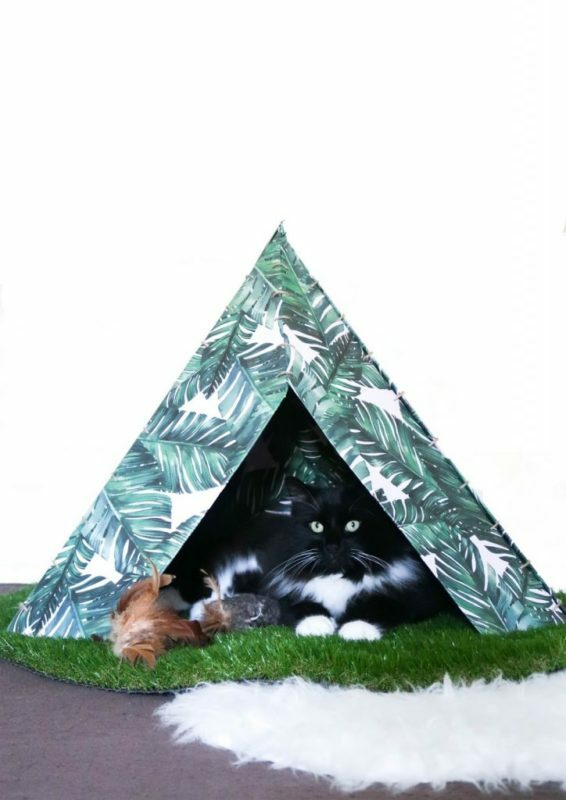 For the winter wilderness cat to get away from the snowy days and just rest indoors. We all know how much cats love cardboard boxes, so why not make a proper house out of it? 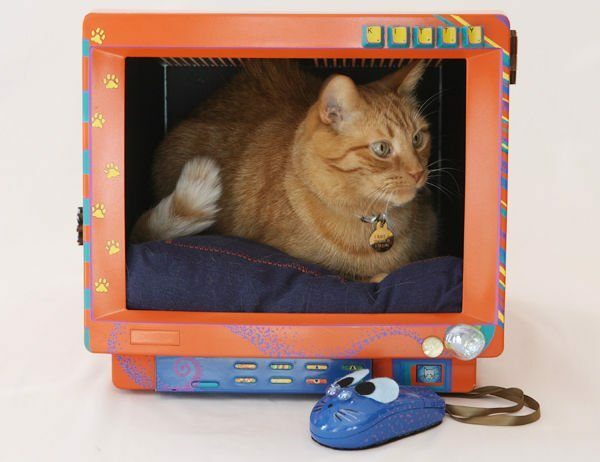 Turn that old computer monitor into something cool, unique, and retro and give your kitty a place to rest. 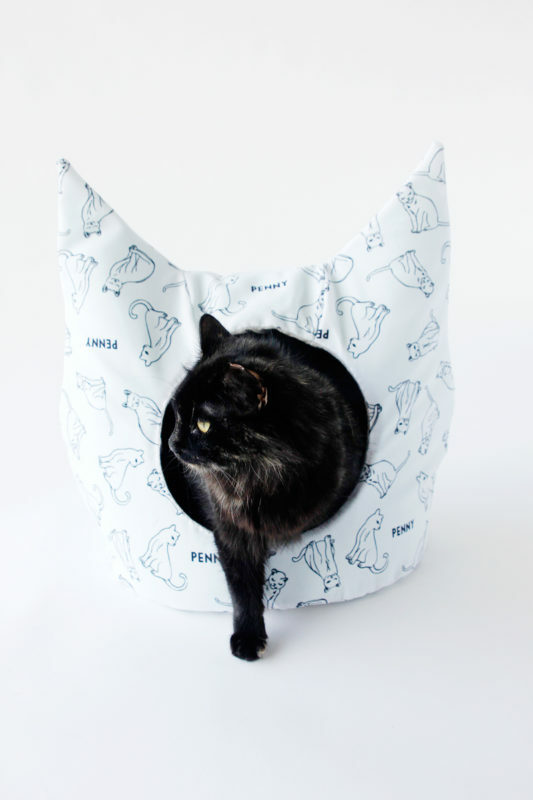 I might just need to adopt more cats because it will be way too hard to just pick one of these charming cat bed designs! 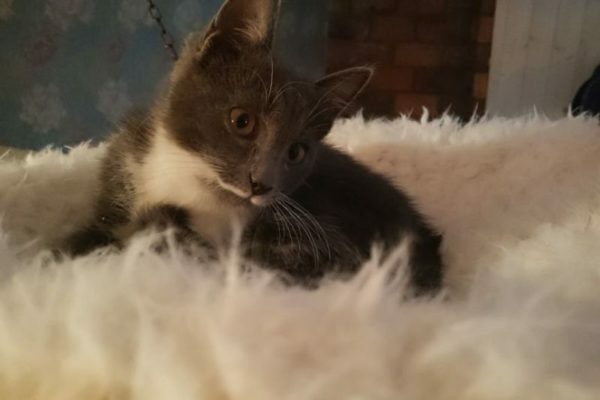 We have seen a lot of creativity in this article with how to build a bed for your kitty in a unique way. Happy hammocks, boho-chic indoor tents, hollowed out computer monitors, and comfortable vintage suitcases. 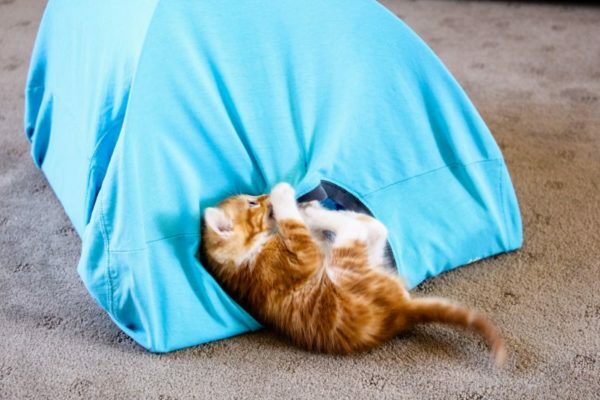 Your kitty just might let you sleep for a week or so after you gift them a new cozy place to hide. One can only hope! 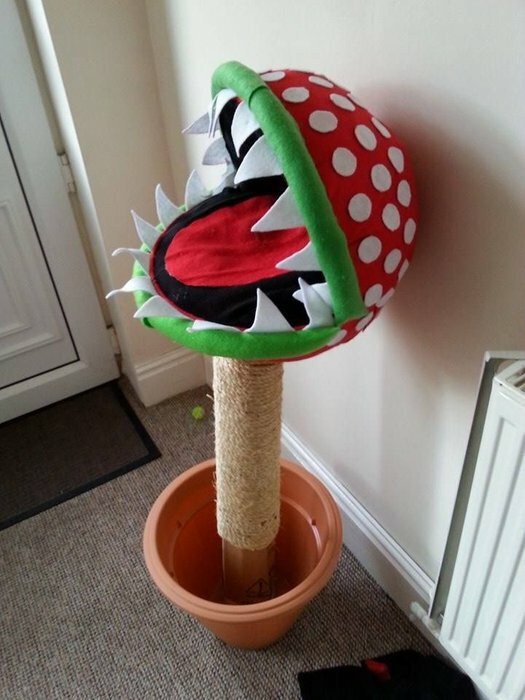 So spoil your cat rotten and start crafting! Have you noticed almost every holiday has some type of gift given? It can become boring over time (and expensive) to keep giving gifts. If you’re looking for a way to save some money and add some excitement to the traditional Easter basket, you’ve come to the right place. There are plenty of creative people in the world, and thankfully, they chose to share their creations with us all via the internet. I’m going to put these ideas in one convenient location for you to scroll through and pick which options would work best for you. If you need to create miniature DIY Easter baskets for a group of kids at church or school, this is a wonderful and cost-effective idea. 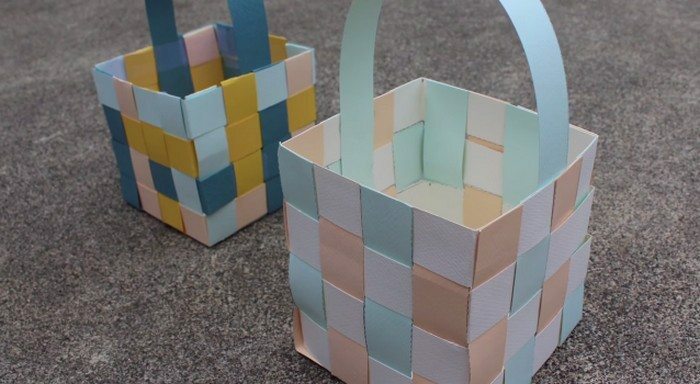 The tutorial walks you through how to weave pieces of construction paper together to where they form a basket. 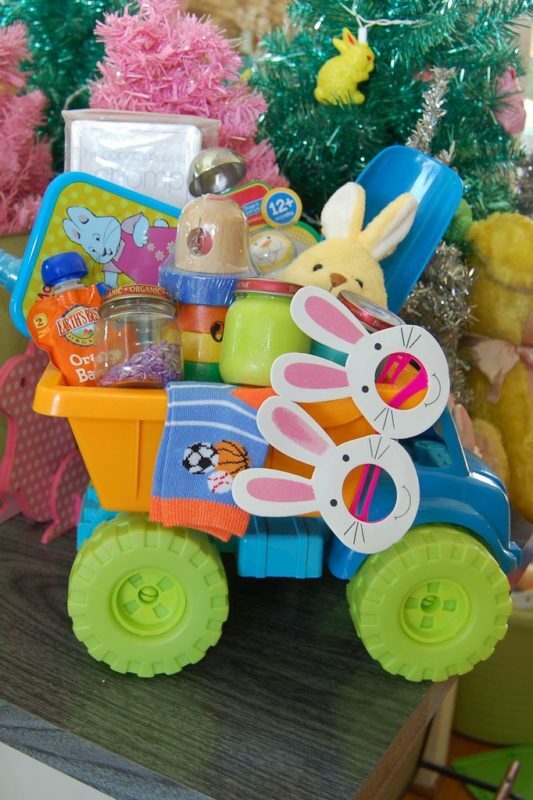 You can add small toys or pieces of candy for a nice Easter surprise. When I watch someone crochet it brings tears to my eyes. When my mother-in-law was still alive, she was a master of crochet. She could make practically anything. Those items she crocheted mean a great deal to me now. If you’re able to crochet, make a child in your life this amazing basket They can hang on to it, and it will be something they’ll treasure as they get older. I love this idea! It allows you to skip past the unnecessary items we usually feel obligated to purchase and head straight to what the kids like. 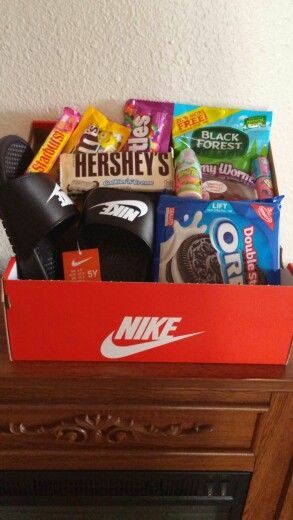 Instead of buying an Easter basket, use the boxes of candy to create a basket. 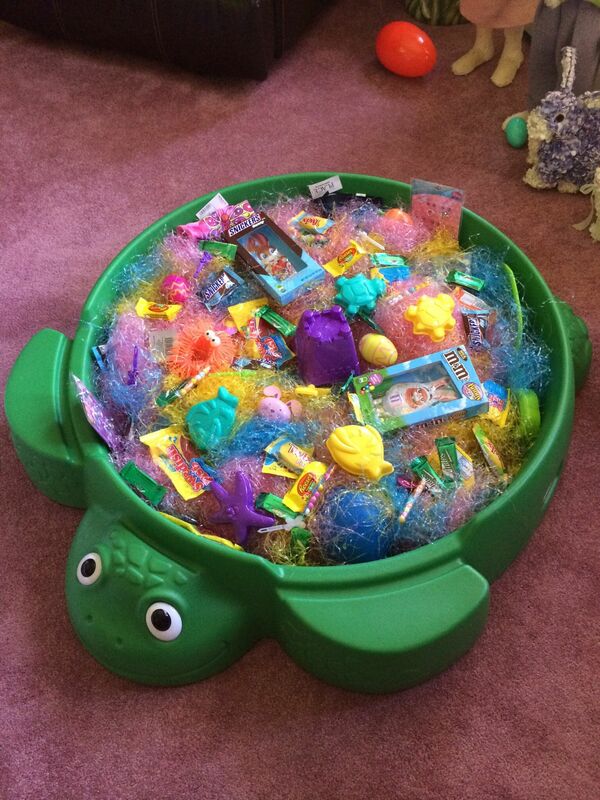 Once you have a basket, add some faux grass, and even more candy. 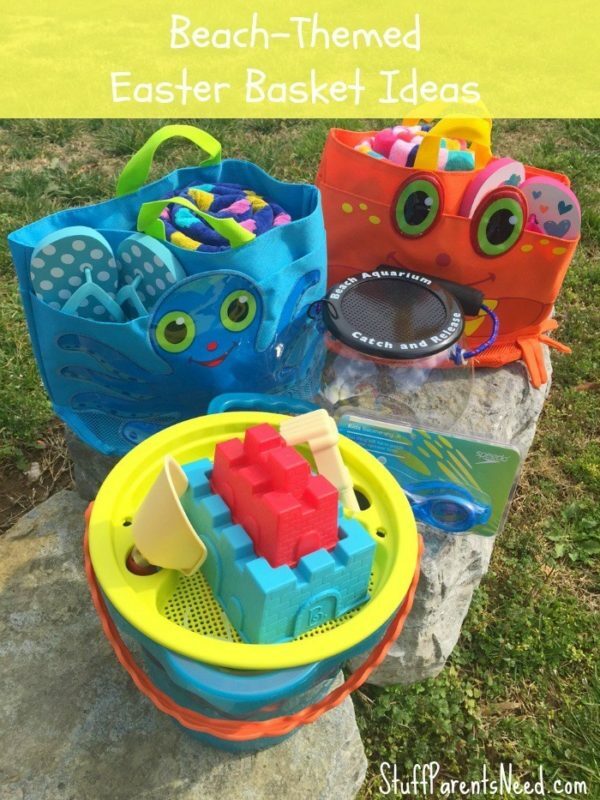 The kids in your life will be happy! If you have any apple baskets hanging around your house, put them to good use. 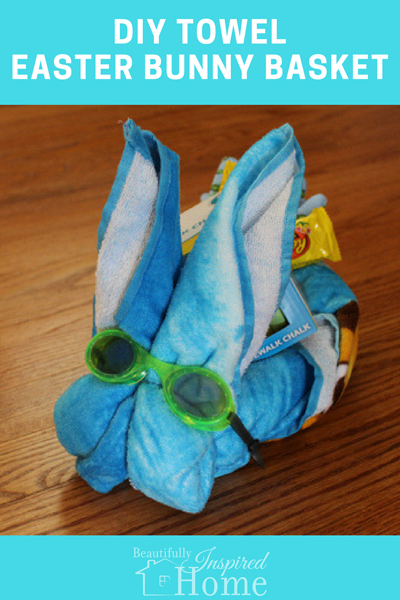 You can follow this tutorial and make it into an adorable bunny Easter basket. It requires a little paint, and they used vinyl for the facial expressions, but if you don’t have the equipment for it you could paint them on. Do you have tons of yarn and aren’t sure what to do with it? 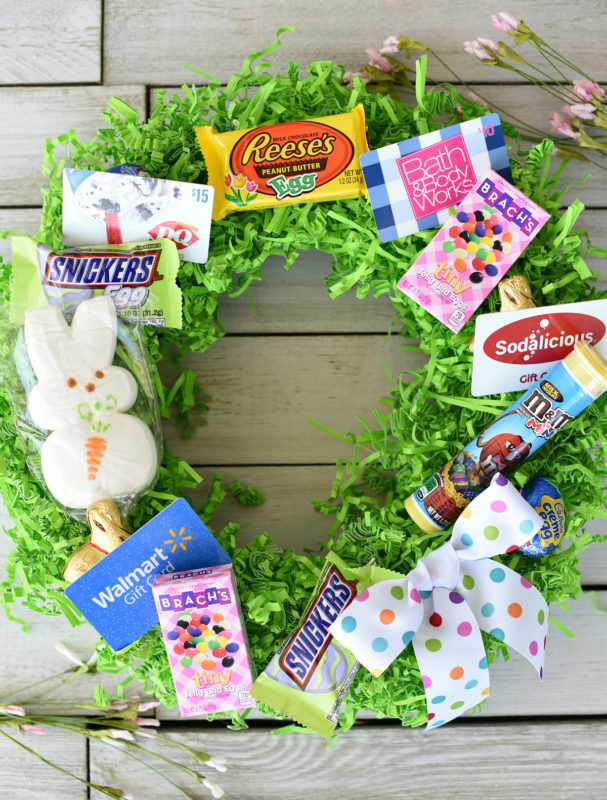 One way to utilize it is to make this festive and pretty Easter basket. It seems easy enough to make. A balloon is blown up and wrapped in yarn. From there, spray it with spray starch and the balloon can be popped once the yarn holds its shape. 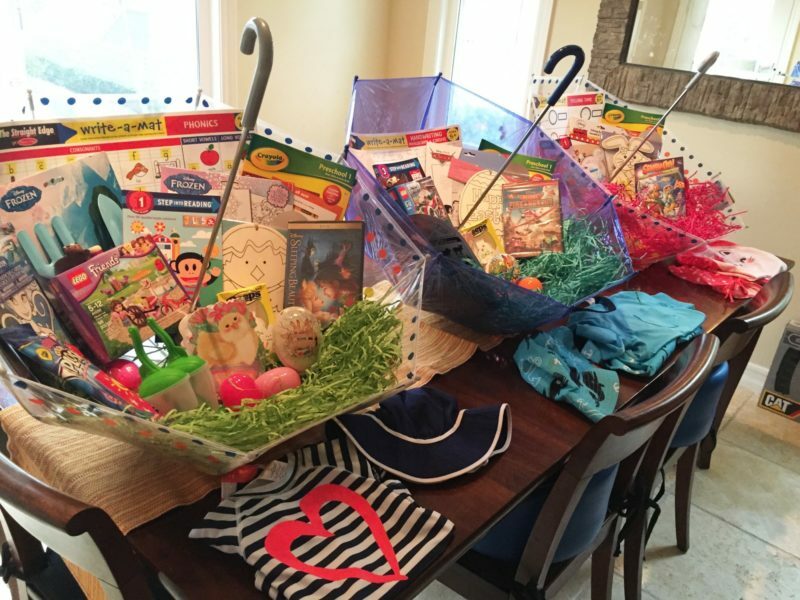 Do you have an old basket, but it’s too plain to use as an exciting Easter basket? Don’t fret. Instead, upcycle the basket into a new creation. 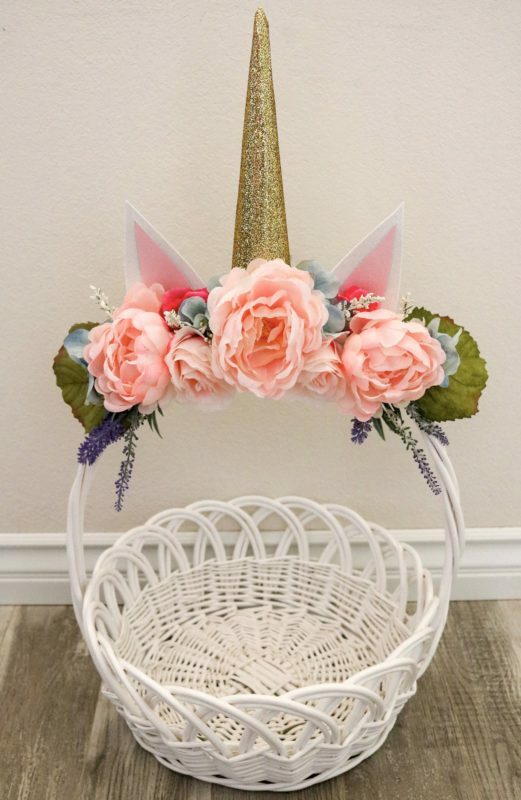 If you have a child in your life who loves unicorns, use this picture as inspiration to transform any old basket into a gorgeous unicorn. This is only a picture, but it seems straightforward to create a replica. 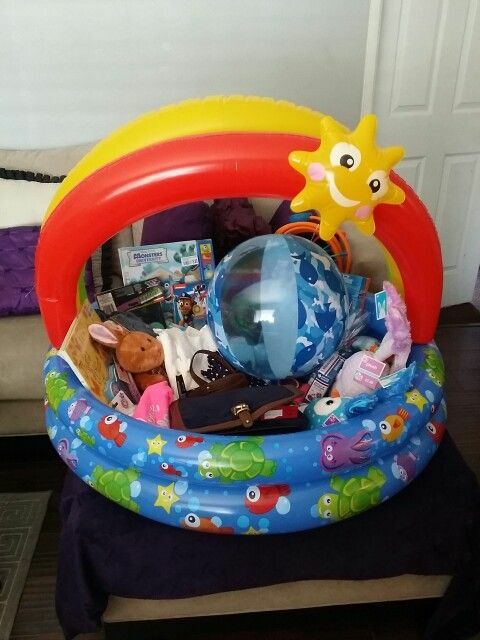 Use a cheap clothes basket and a pool noodle to make the shape of an Easter basket. Fill the inside of the basket with faux grass, and paper mache the outside to make a festive design. It would be a beautiful decoration. 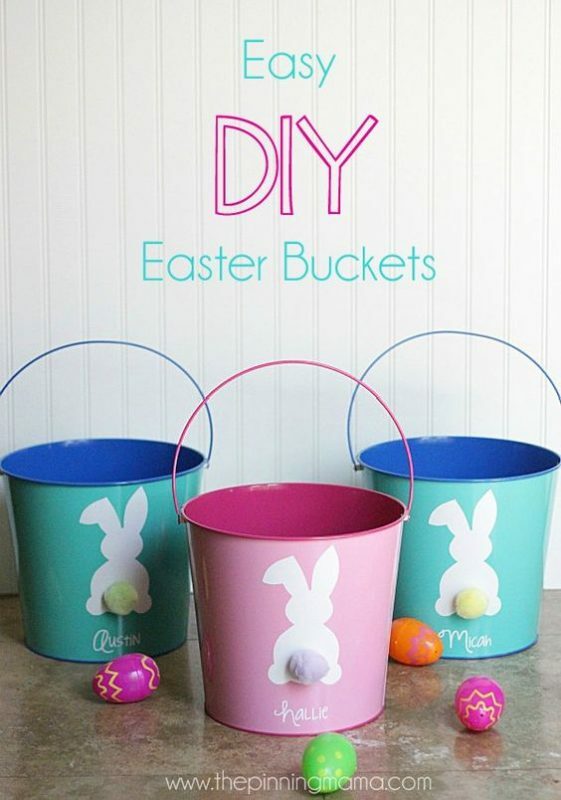 If you can buy a festive Easter bucket, you can customize it easily with this tutorial. They give you a bunny silhouette you can print off and paste on the bucket. Plus, you can type your child’s name beneath the bunny. 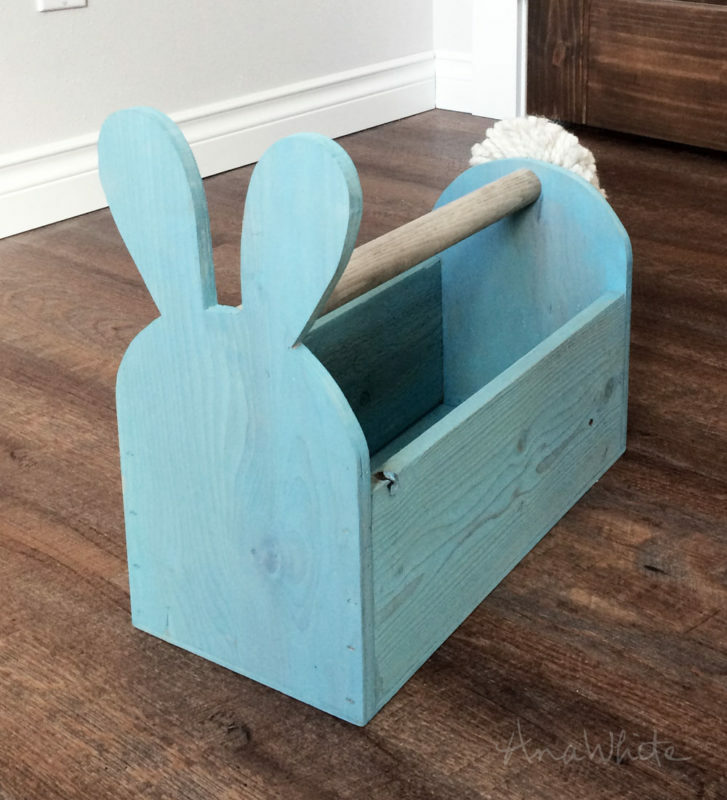 Once finished, add a cotton tail, and no one else will have a bucket like your child. You can usually find a basic lattice basket for little money at most big box stores or bargain stores. Once you have the basket, you only need a few pieces of felt and a glue gun. 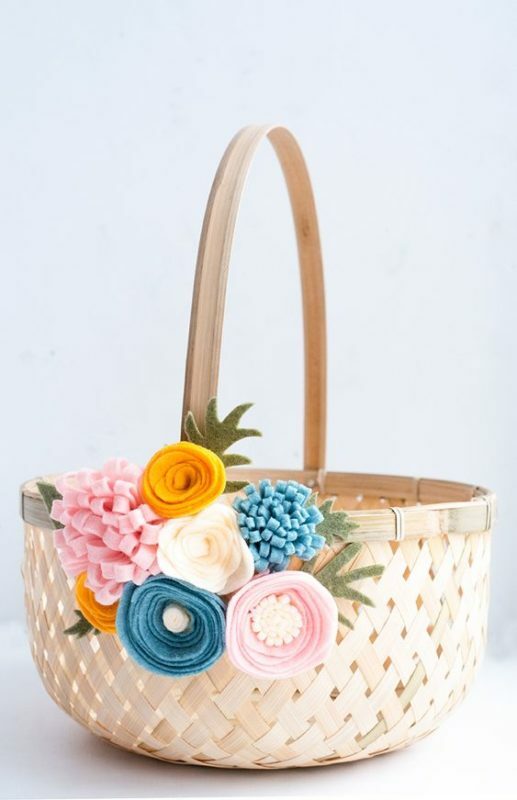 The tutorial walks you through how to make felt flowers and how to attach the flowers to the basket. Your basket will be unique and beautiful. 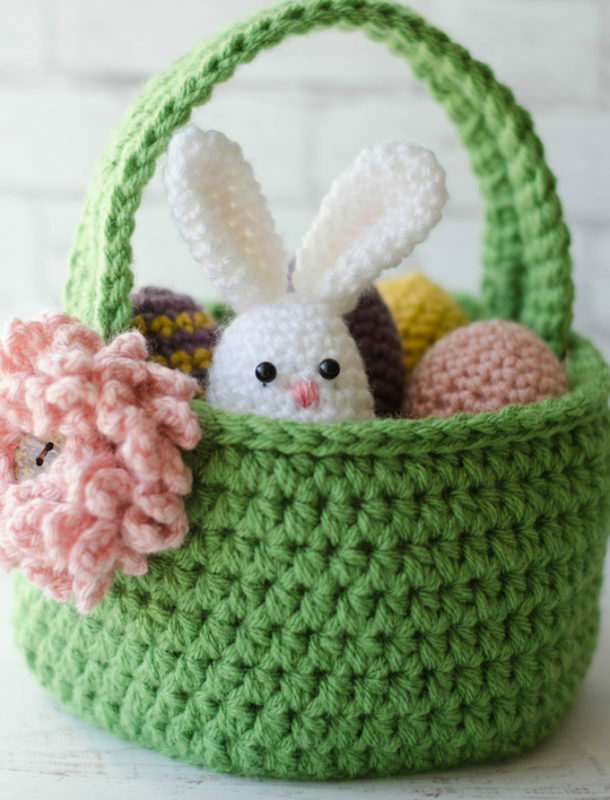 If you have a variety of fabric scraps, it could be the perfect combination to make a gorgeous and cost-effective Easter basket. This tutorial walks you through the entire process of putting the scraps together to make a basket. It can be filled with delicious goodies and be a keepsake for years to come. If you’re like me, you may struggle in the craft department. I can come up with cute ideas, but if I have to work hard to execute them, they usually end up looking like a kindergartener created them. This idea is one which requires no sewing. 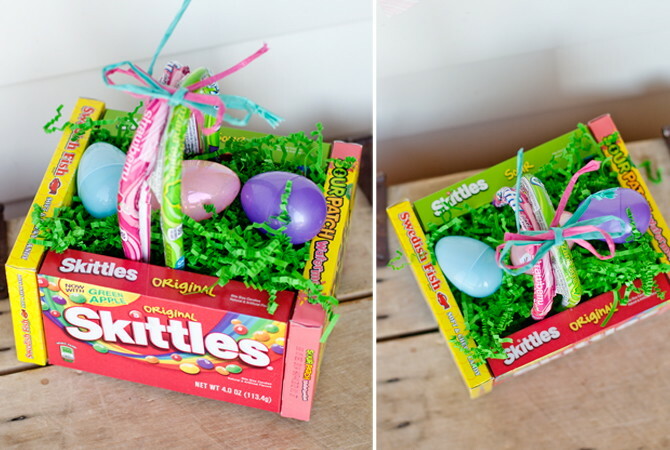 Therefore, it should be easy to create a cute DIY Easter basket without all of the fuss. 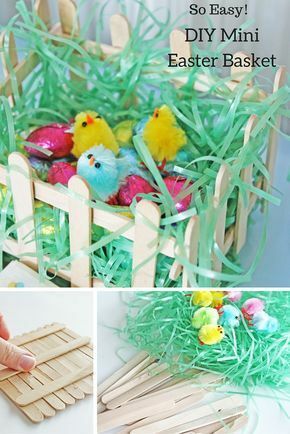 These mini cups are another great idea if you must make quite a few DIY Easter baskets, and am working on a budget. 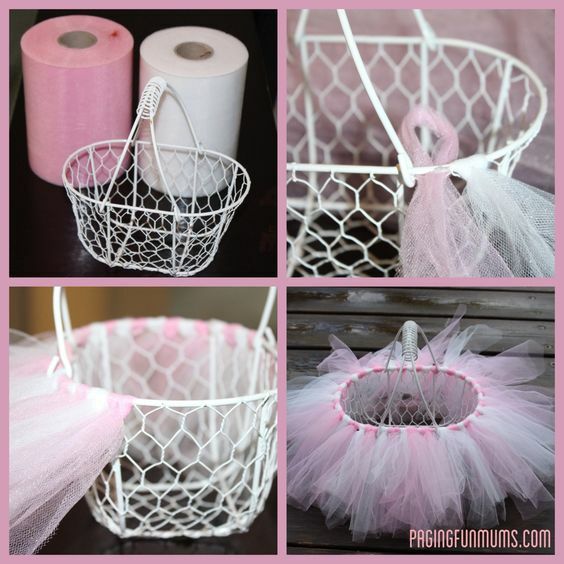 Instead of buying many smaller baskets from the discount store, use this tutorial. 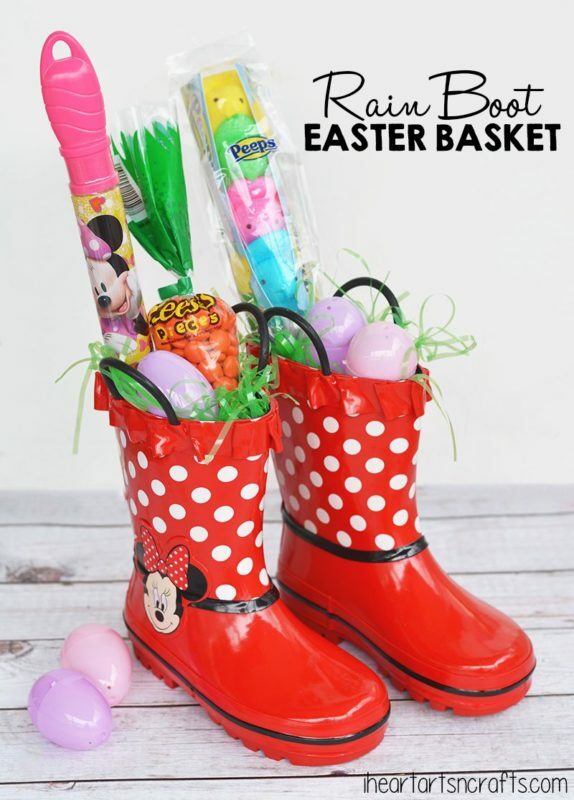 They show you how to convert red plastic cups into adorable Easter baskets, which can be filled with small goodies and make someone’s day. Do you have someone in your life who loves all things ballerina and tutus? You should consider making them this basket. The tutorial shows you how easy the whole creative process is. If you have the time and would like to save some money too, consider this option. 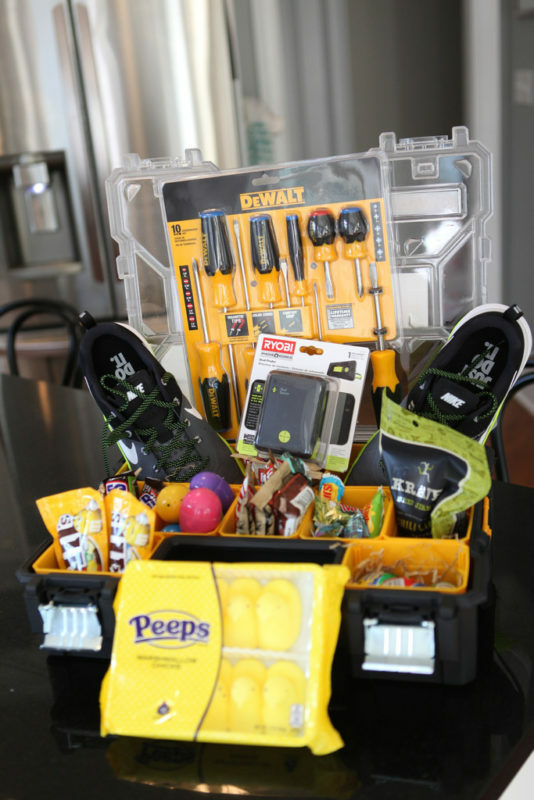 If you’re handy with a few tools around the garage, this could be a great idea to make a DIY Easter basket which would last. Ana White gives you all the steps in the process you need. She also provides plans to make the build easier. I love it when people share ideas for simple mini baskets. They are invaluable to school teachers, Sunday school teachers, coaches, and any other leader of a group which must produce 10 or more festive items each holiday season. 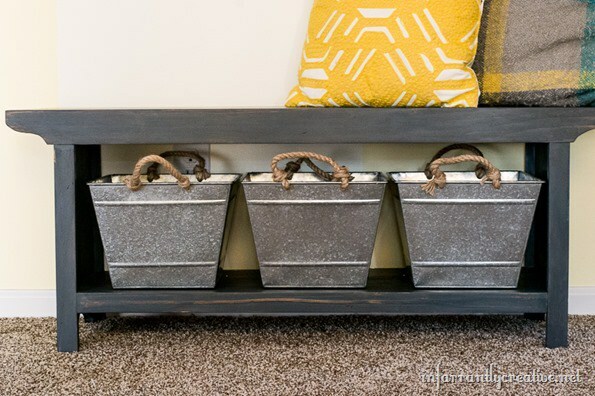 These small baskets are easy to build, very cost-effective, and cute. They show you put time and consideration into what you’re giving to others. I love when you can take part a gift and make it into the package itself! 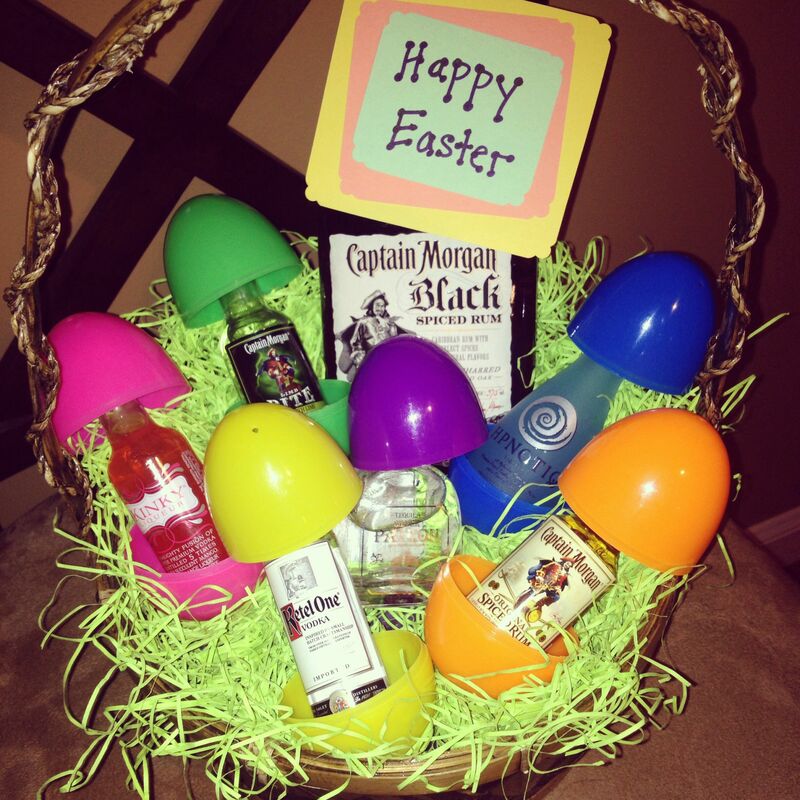 This is an excellent idea for an Easter basket. When spring rolls around, kids may need new rain boots. Instead of putting the boots in something, use the boots as the basket. It’s cute and smart too. 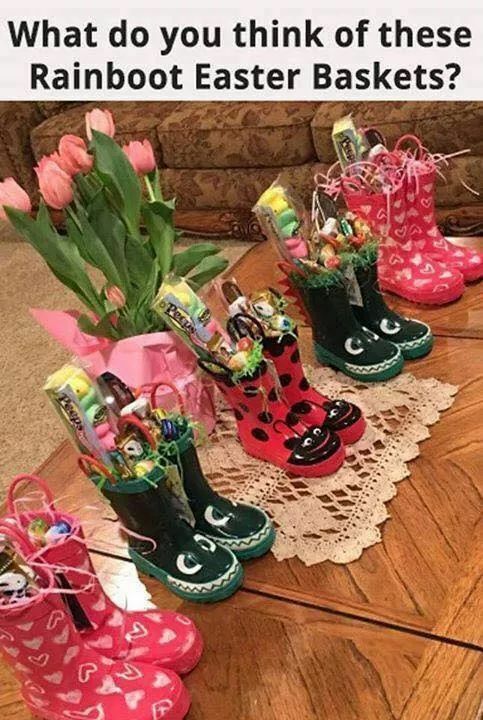 This is a great idea for those who like to keep Easter baskets simple or those who give out quite a few Easter baskets each year. You can skip the basket altogether. 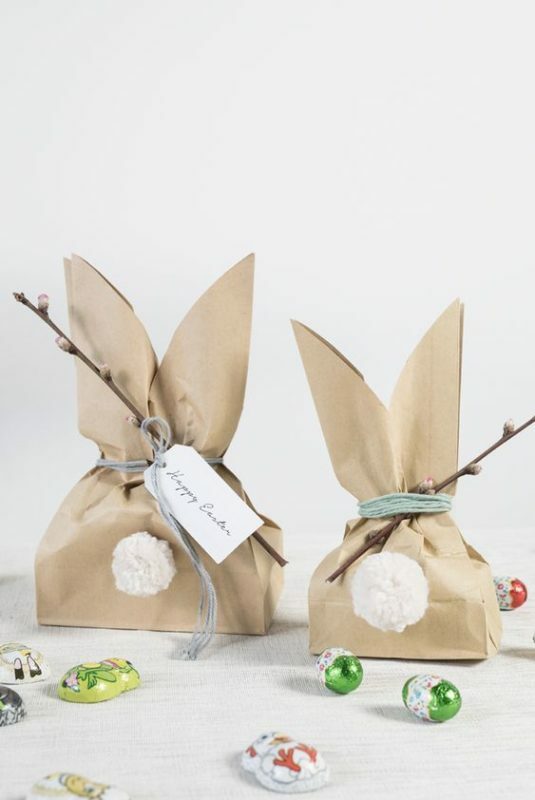 Instead, use brown paper bags and this tutorial to make festive (and adorable) bunny bags! 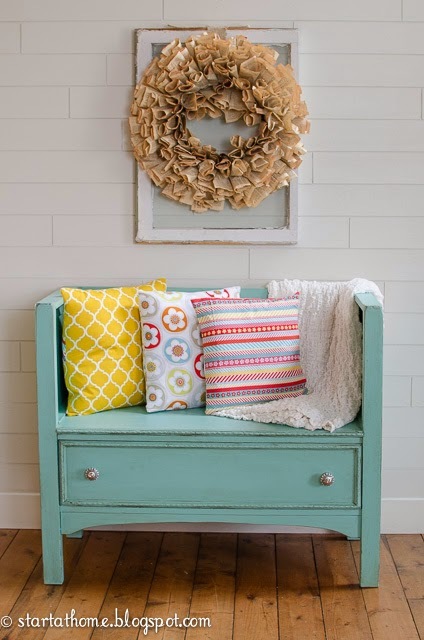 This tutorial is a great way to bring life to an old basket. 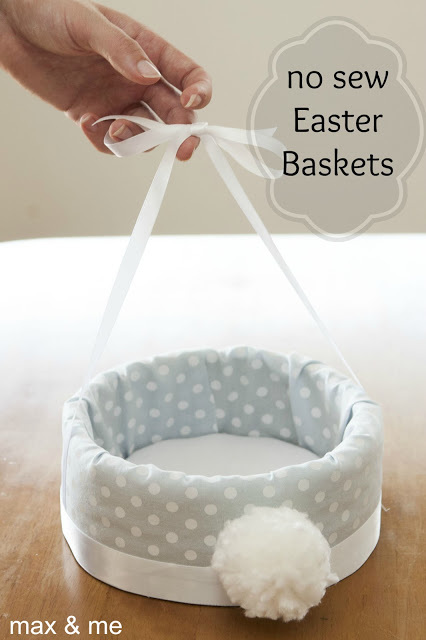 If you have a plain basket, but you’d like to make it more festive for Easter, create your own basket liner. 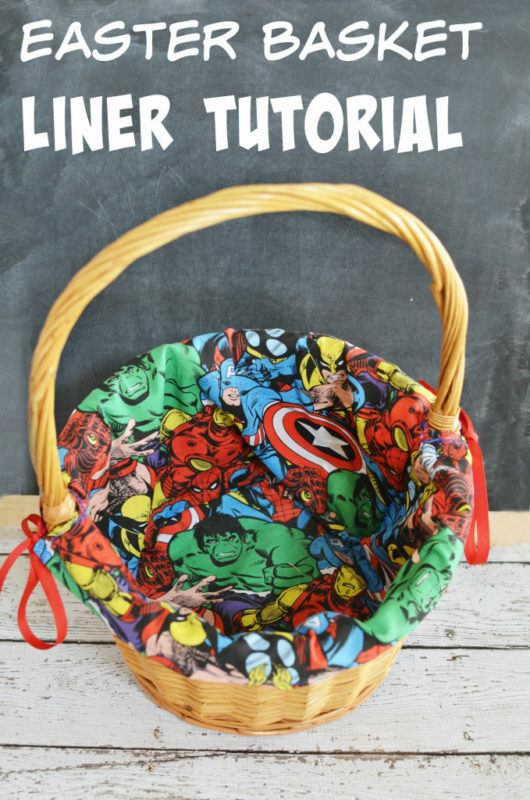 The tutorial shows you how to make a basket liner with Marvel characters, but it could be tweaked to work for whatever your kids love. 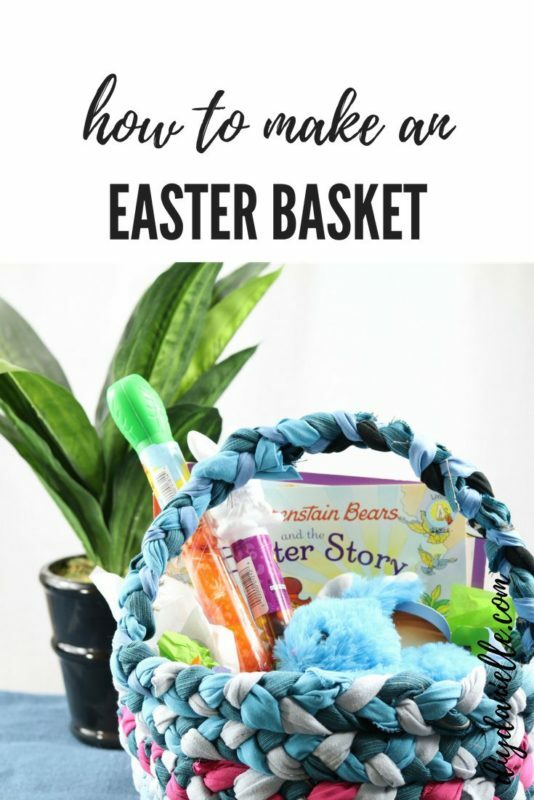 These are 18 different ideas for making your own creative, cost-effective, and adorable DIY Easter baskets for the kiddos in your life. 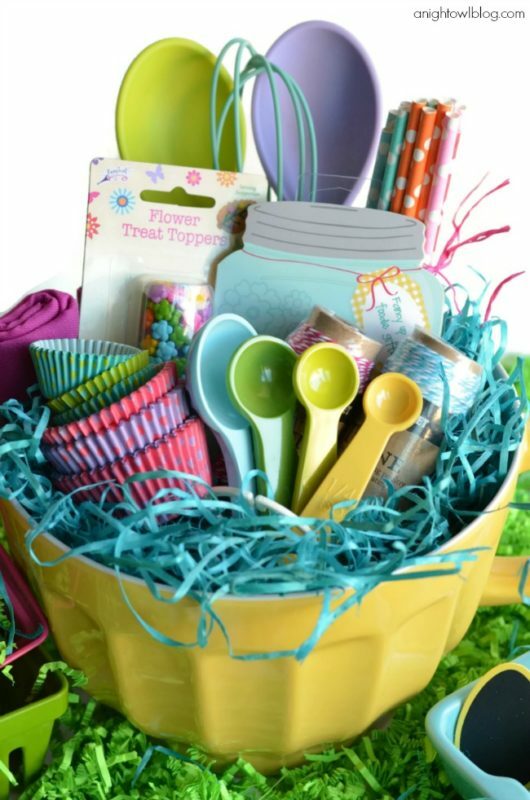 Fill your irresistable baskets with colorful eggs, or let your kids help with creating crafts to accompany your stunning baskets. 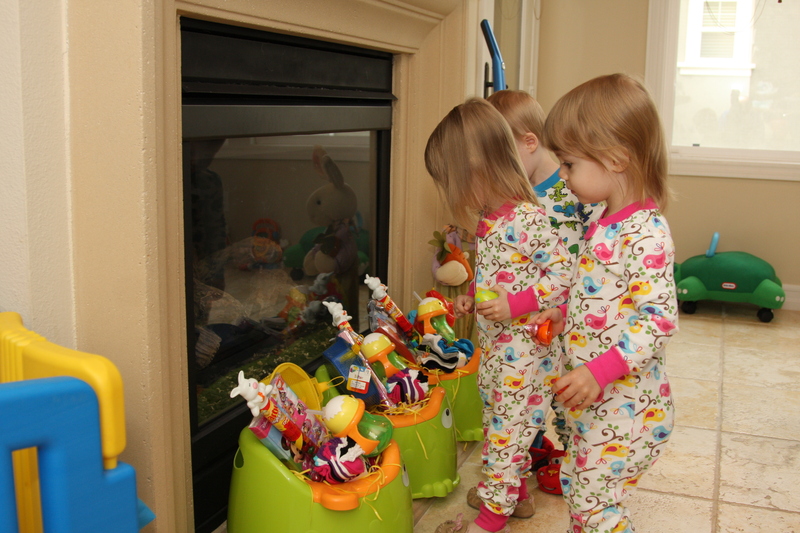 Having unique Easter baskets are wonderful on Easter morning, but they’re also great at crowded Easter Egg Drops. 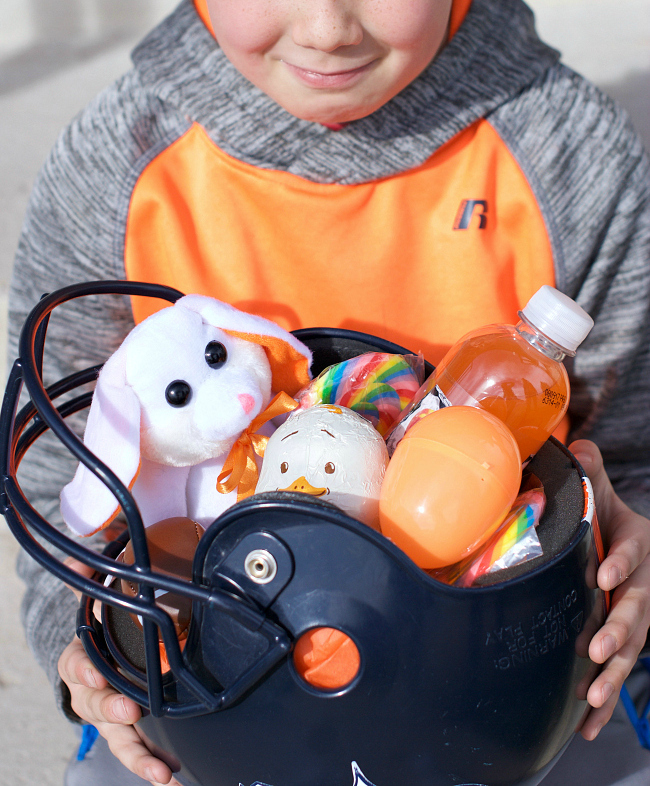 There’s less chance your child will lose a basket you customized for them. We hope you enjoy your Easter holiday and make lots of wonderful memories! Looking for a weekend project to keep you busy? 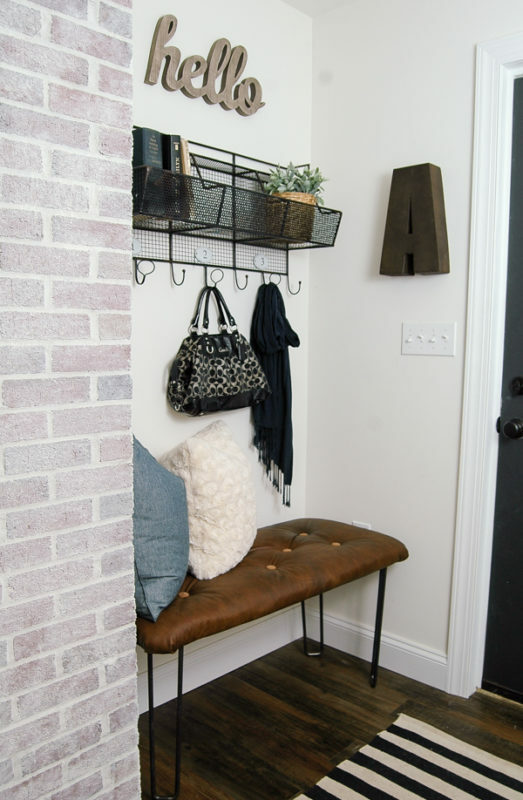 Needing a little place to sit as you put on your shoes to go out the front door? Or maybe you want an extra area for your clothes in the bedroom? No matter what your reason, building your bench is a fun, sometimes challenging, most-of-time easy, and rewarding experience. You will be proud of your result and want to show it off to your friends and family. 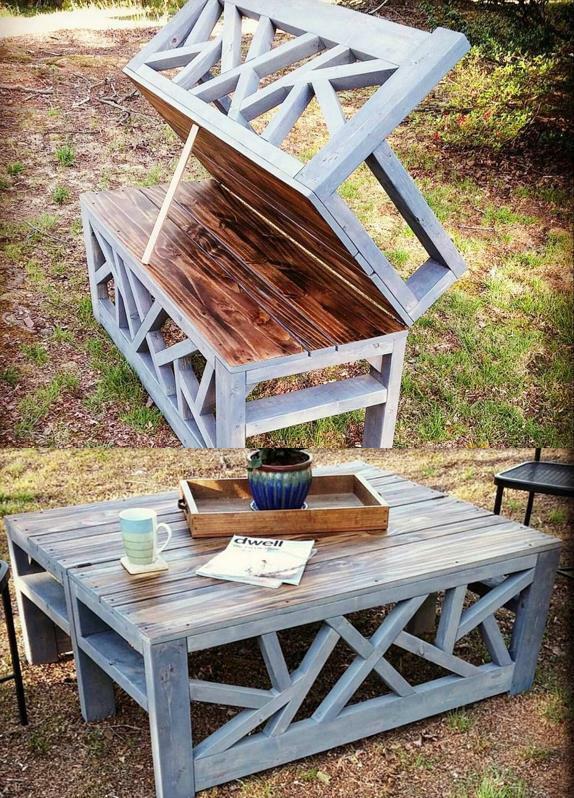 Or, maybe, you want to build this bench as a gift to your friends and family! 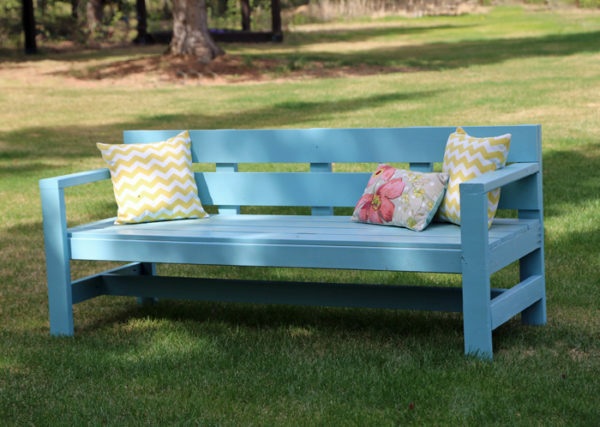 There are tons of ways to design your bench as you will see below. You can go for something more simple and minimal, or something vibrant and funky. Build something that takes up little space or something to hold the whole family. Take a look at the images below and pick your favorite tutorial and let's start building! A very minimalistic bench with lovely metal hairpin legs and a beautiful board of wood. Have a beautiful piece of fabric you've been waiting to use? Now is your chance! Oh so chic! 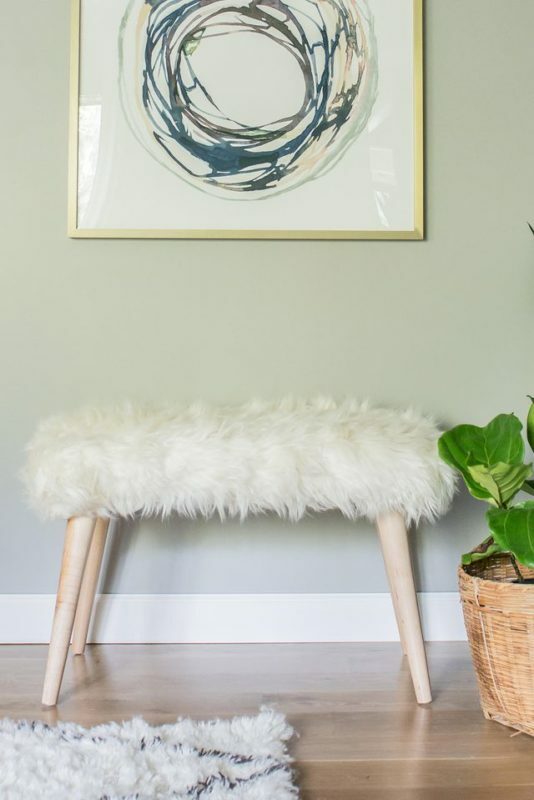 I'm in love with this charming shag rug bench and the fact that it's also a DIY project! 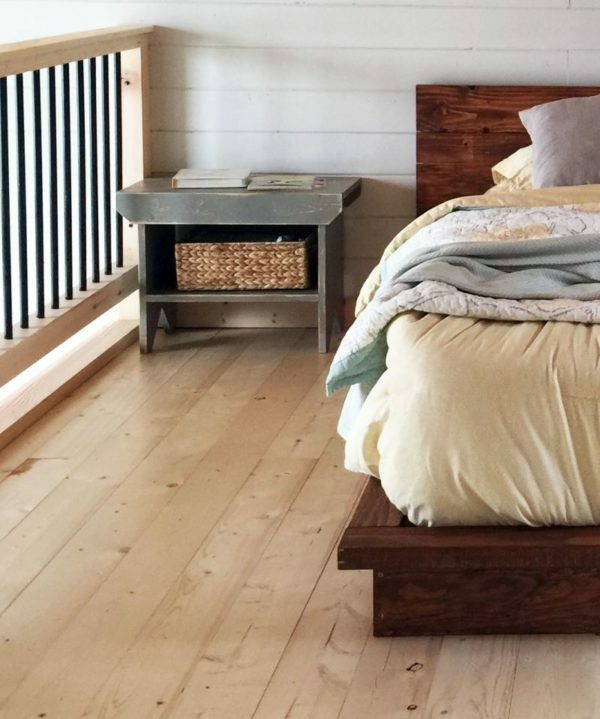 Benches don't always have to be used for sitting; you can make use of it as a nightstand and storage unit too! Every garden should have a bench so you can enjoy your hard work and the smell of the blooming flowers. 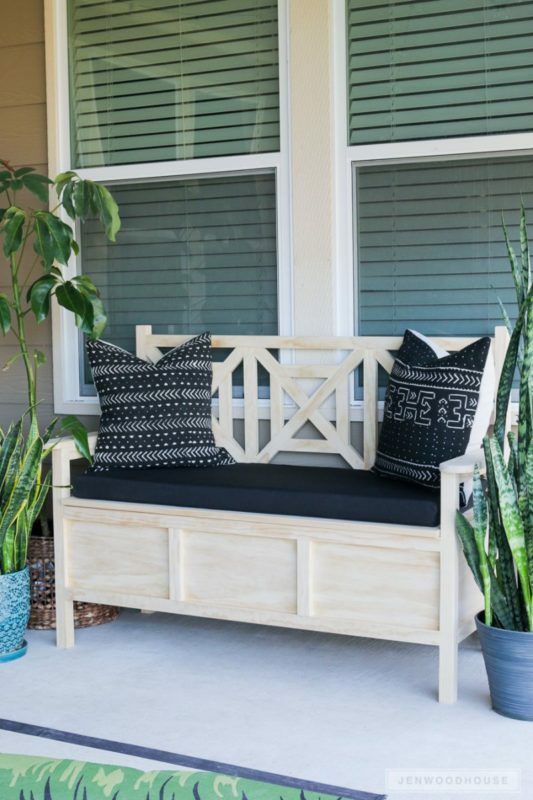 You shouldn't have to pay a ton of money for a stylish bench when you can make a knock-off one for cheaper. 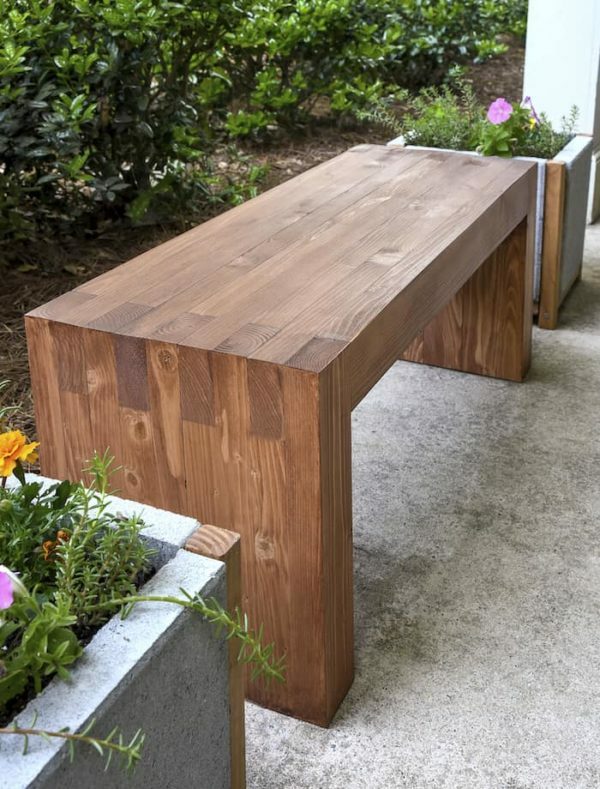 A modern wooden bench that is minimalistic and could work delightfully indoors or outdoors. 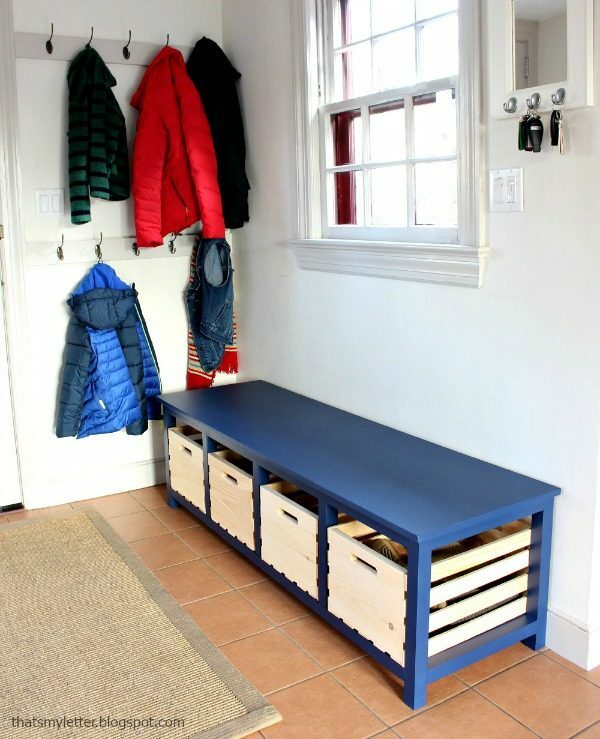 A great way to keep your front hall from getting messy is to build a bench with built-in shoe storage crates! I am all for furniture with a multi-functional purpose, which is why I'm in love with this design that's both a table and a bench! 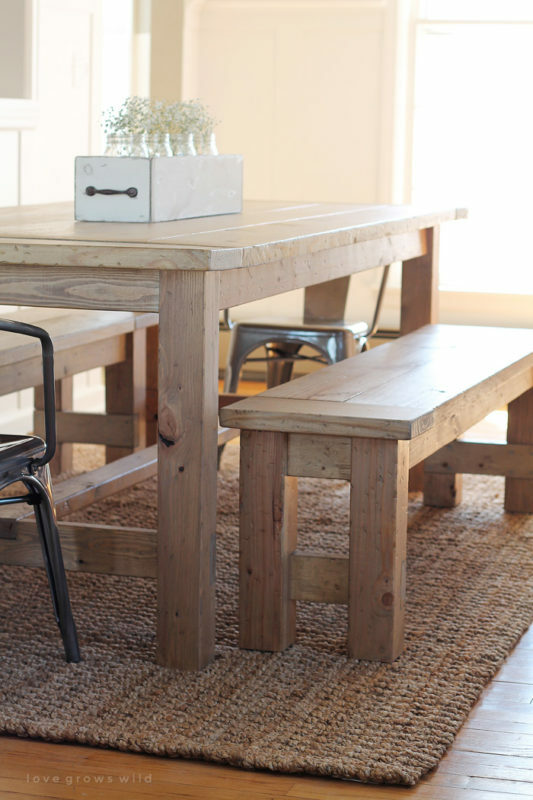 A great functional farmhouse bench to add to that rustic feeling you're going for. 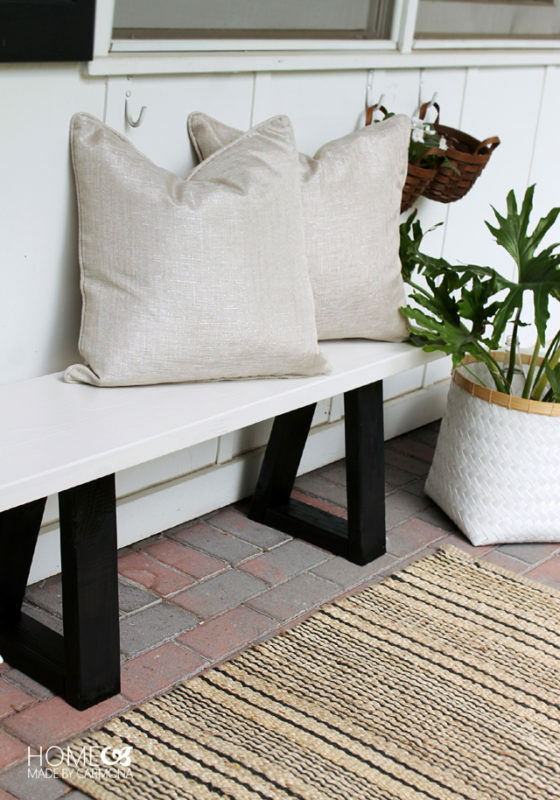 Make a bench out of recycled, handmade, or brand new crates for a unique look. 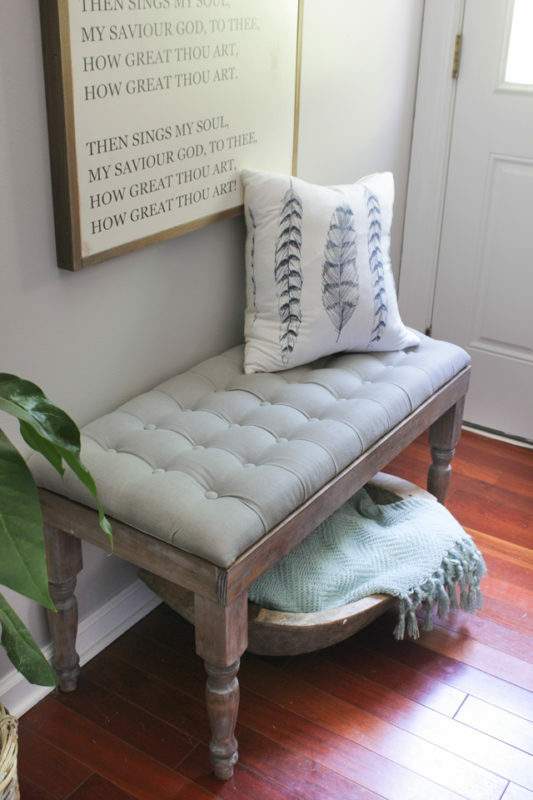 This bench is gorgeous and would work lovely as a front entrance bench or piano bench. This bench is made out of two recycled chairs and transformed into a whole new piece of furniture. 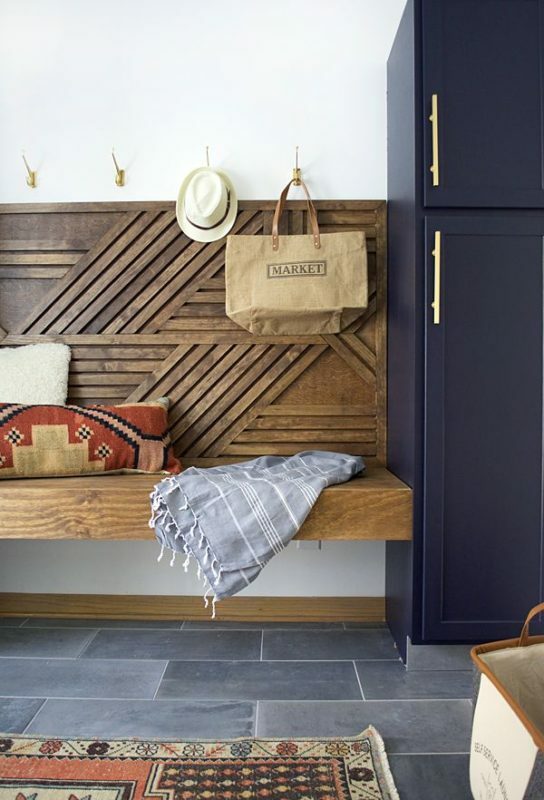 This farmhouse-styled bench has a cool weathered look to it with plenty of room for storage bins. 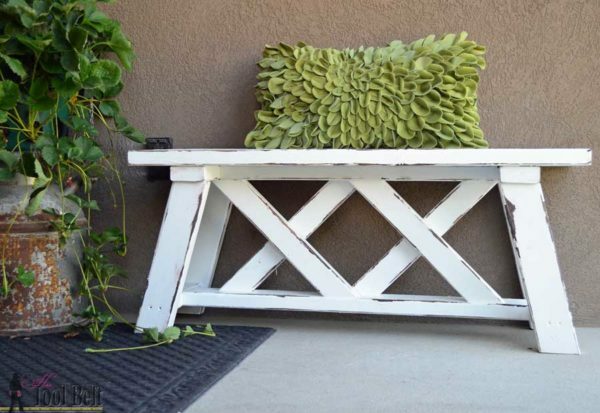 Give your house that rustic feeling with a DIY farmhouse-style bench on your front porch. 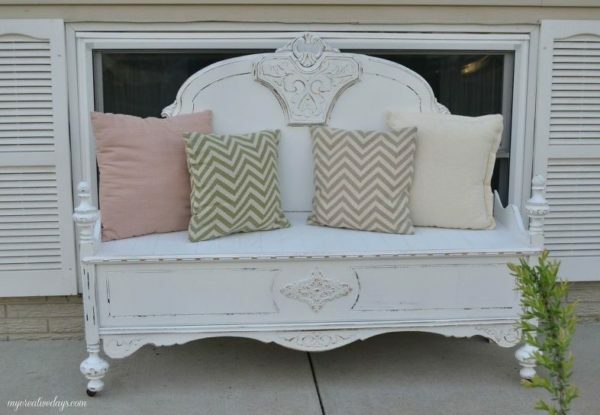 How adorable is this tiny bench made out of an old dresser? I love that there's is still a drawer for extra storage. 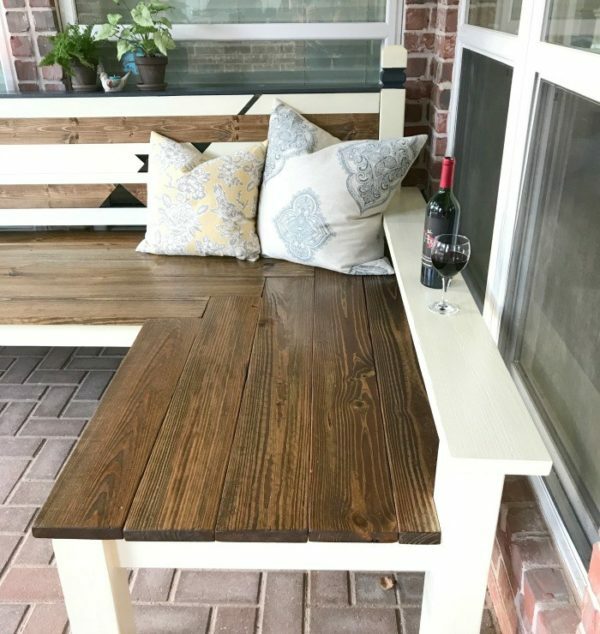 For all you beginner carpenters out there you will surprise yourself with how easy of a build this rustic bench is. 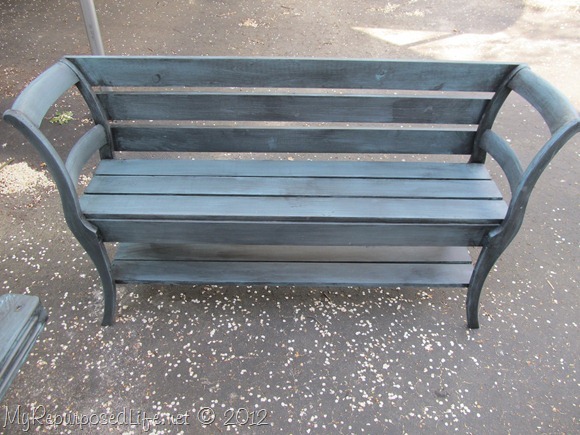 A charming outdoor bench with easy-to-follow building plans and pleasing result. Do you have a big family? You might need extra seating or an extra big bench like this one! 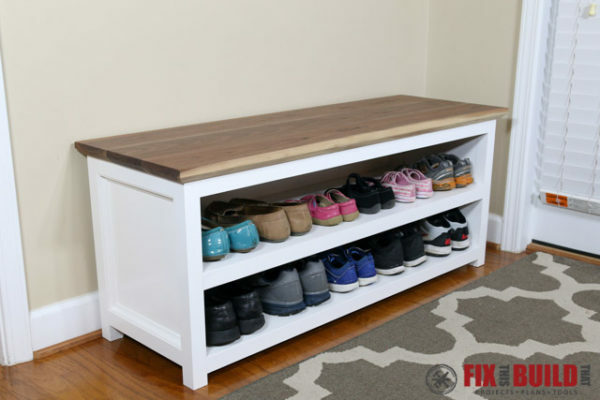 This is a great bench project for those of you who may have a few too many pairs of shoes! What a transformation! 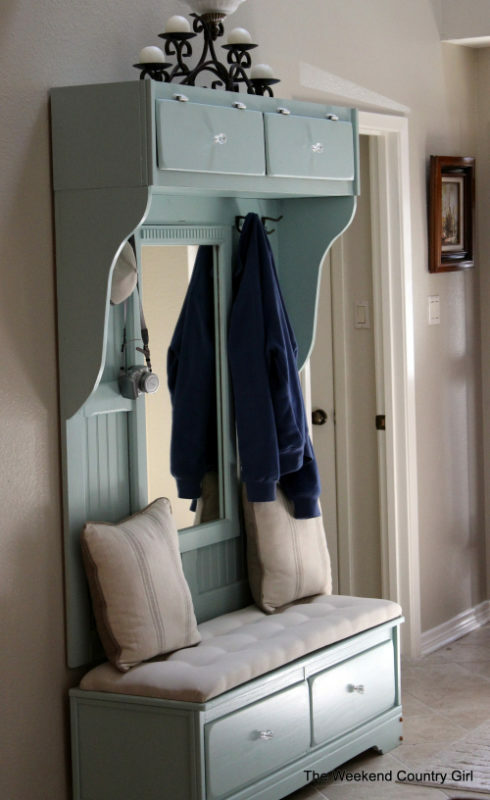 From an old dresser to the perfect mudroom bench with lots of storage and even a mirror! A floating bench with a handmade (and gorgeous) geometrical wall behind it will be sure to impress! 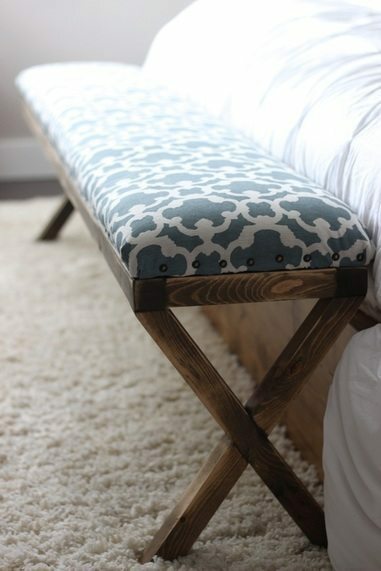 I love the soft and straightforward tones of this elegant bench, but you could customize it with your own fabrics. So cute! 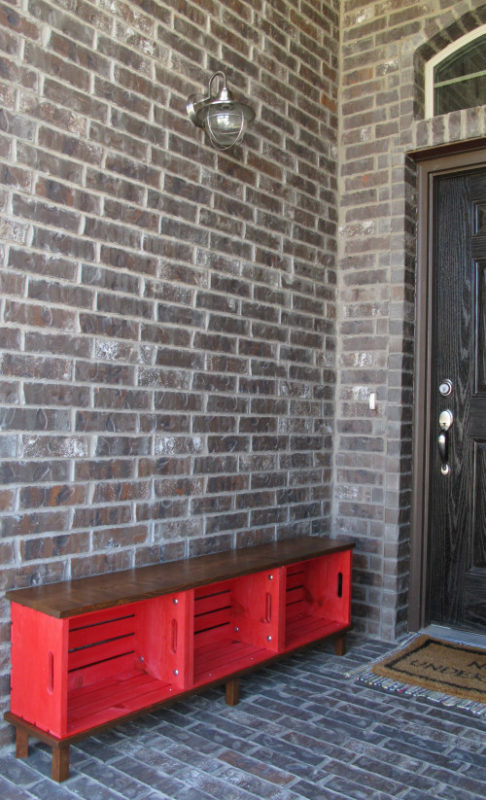 This awesome DIY project is one that you'll be bragging about when you're finished. 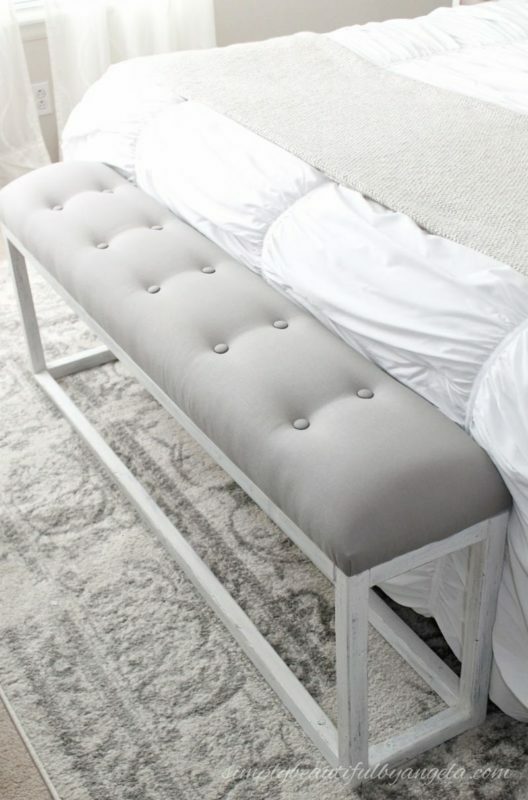 How adorable is this little white bench made using parts from a vintage bed? Have you ever been in the middle of a remodel or redecorating an area and not been able to find the items to match the look you were going for? I found myself in this exact predicament about a week ago. 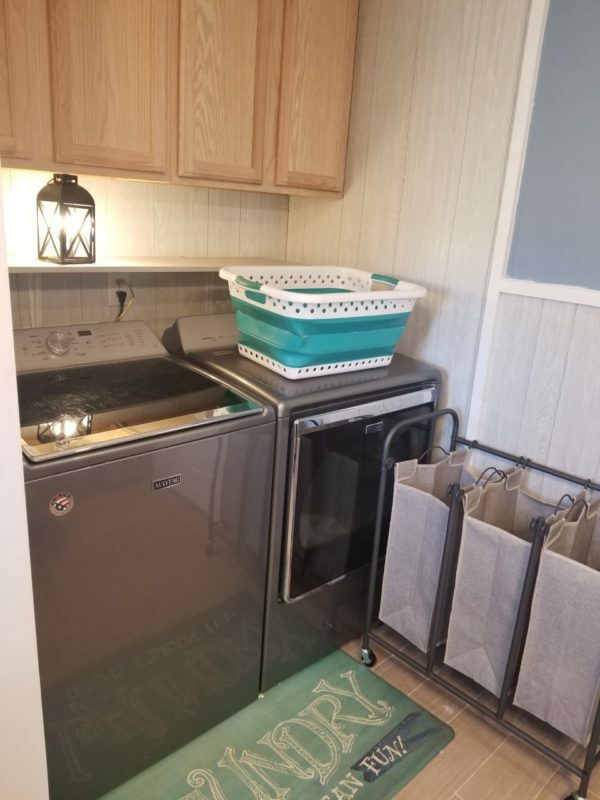 We remodeled our bathroom and laundry room combo. The corner where my washer and dryer are hooked up seemed rather dark. I didn’t want to wire an overhead light in the area, but I couldn’t find a lamp to suit my taste. This was when I had the idea of making a lamp. It’s a simple process, inexpensive, and gave me the light I needed with a look I wanted. 1. What Should I Use for a Lamp? What I love about making my own décor is it has my style and my design behind it. You won’t walk into someone else’s home and see the same item. The other cool part of DIYing your own décor is it usually saves you money. Before I decided to make my own lamp, I looked at a track light to hang overhead in the bathroom and position the lights to where some would shine in the dark corner. When I looked at the lighting options, they were more money than I wanted to pay. This is when I decided to create my own lighting choice. You can use almost anything to make a lamp. People use vases, wooden stumps to make a lamp base or keepsakes. As long as you can drill a hole through it, you can turn it into a lamp (in most cases.) The other issue I faced was I needed a shorter lamp to fit on a shelf between laundry cabinets. Therefore, I decided to buy a metal lantern to where the light could hang down into the lantern instead of standing on top of it. Look around your home or local big box store and see if there’s anything which strikes your fancy to make a gorgeous lamp. Once you have picked out your item, grab your drill. You must drill a hole through the bottom of the object to allow space for the cord to run through. 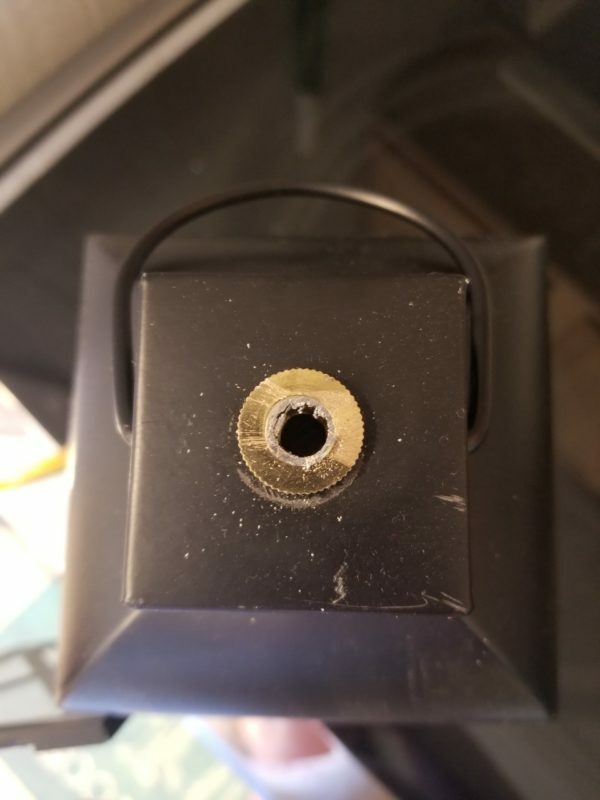 You must also drill a hole through the top of the object to allow the cord and light bulb socket to either stand up on top of the item or be hung upside down through the hole. Be sure to drill holes in the proper locations. 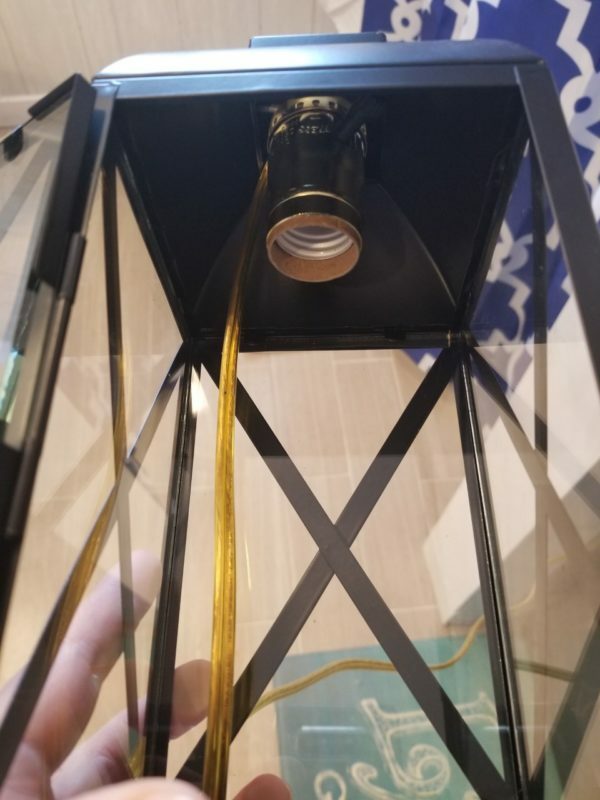 On the bottom, you’ll want the cord to run off to the side or back to make sure the lamp doesn’t wobble when sitting on its base. For the top hole, it should be centered to make sure the light bulb doesn’t hang off center. Also, make sure the hole is large enough to fit the cord, and the end piece of the light bulb socket fits into it to be held securely. If the hole is too small, the cord could be damaged running through it. If it’s too large, the entire socket won’t be secured. This impairs the functionality of your lamp. When you’ve drilled your holes, attempt to run the light cord through them to make sure you have the proper fit before moving on with the process. The basic idea of any lamp DIY kit is to run the cord through the holes in the lamp. When the cord has been run, you’ll notice two wires open at the end of the cord. Read the instructions which come with your lamp kit to know where to apply the wires inside the socket. 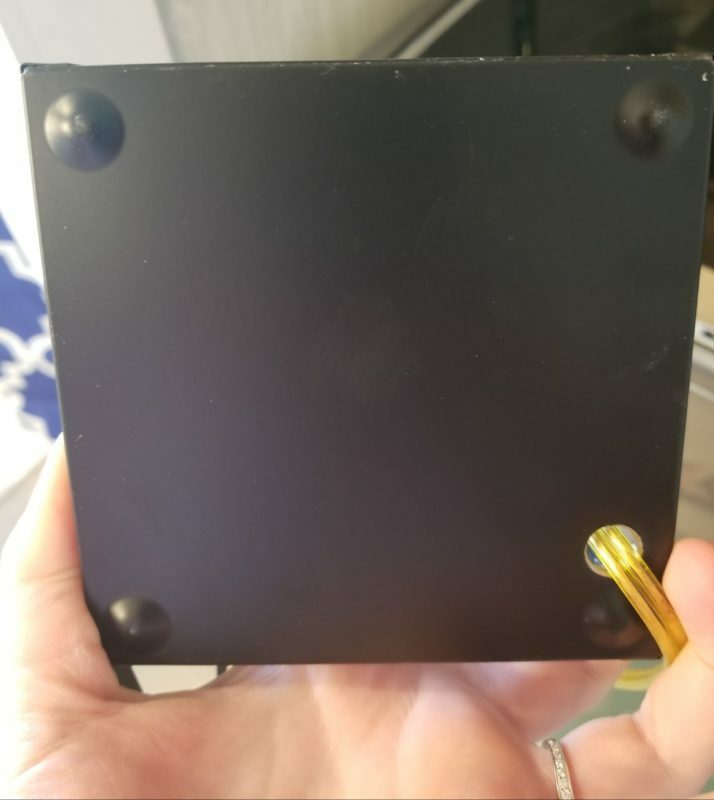 Once the wires have been applied to the socket, apply the fitting to hold everything securely. Again, because each lamp kit varies, be sure to read the instructions which come with the kit you purchased. If you want the light bulb to hang into something, hang the socket upside down and use the finial to hold the socket in place. It will go on the outside of the lamp and directly on top. Cut off the top of the finial if it's sticking up too far. Finial attached to the top of the lantern to secure socket with the top cut off. If you want the light bulb to stand erect on top of the lamp with a shade, stand the socket up in the hole you drilled in the top, attach the harp around the socket, and secure it with the finial. When your lamp kit has been fully put together, it should look like a lamp which is only missing a light bulb and possibly a shade, depending upon the style of lamp you chose. I went with an LED light bulb inside my lamp because it puts off a nice amount of light in the space but doesn’t become hot. If you don’t have an LED light bulb, and you’re making a lamp where the light bulb will be enclosed, be sure to super glue the cord to the side of the inside of the lamp to keep it away from the light bulb to avoid any potential fire hazards. In fact, I’d highly recommend you only use an LED light bulb with an enclosed lamp for safety purposes. If you made a typical style lamp with the light bulb on top and a lampshade, screw the light bulb into the socket. Remove the finial from the harp around your socket, apply the lampshade, and reapply the finial to where everything is held securely in place. With the method I used to make my lantern lamp, I spent approximately $13, and it only took about 10 minutes to construct the lamp. Remember, if you haven’t made your own lamp before, it may take you a little longer. The price of the lamp could be only the cost of the lamp kit if you have the item you’re making the lamp out of at home already. The price could jump if you choose a fancier or more expensive item to make a lamp from. 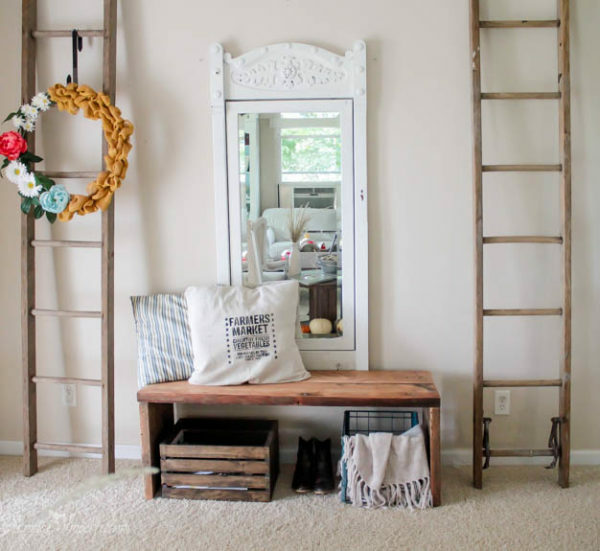 Hopefully, this tutorial will inspire you to make your own home décor and creations. It’s a great skill to have and can work wonders for your budget. It could even become a new side-gig to make extra money, if you can make lamps people love and would want to purchase from you. As you can see, the options are limitless when you open your mind to creative DIY projects. I hope you’ll enjoy your lamp as much as I’ve been enjoying mine.